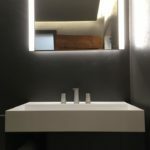 Meinardi Sas is the area reference point for the Kerakoll Design House program: a program of (Re) design that is the Make up! 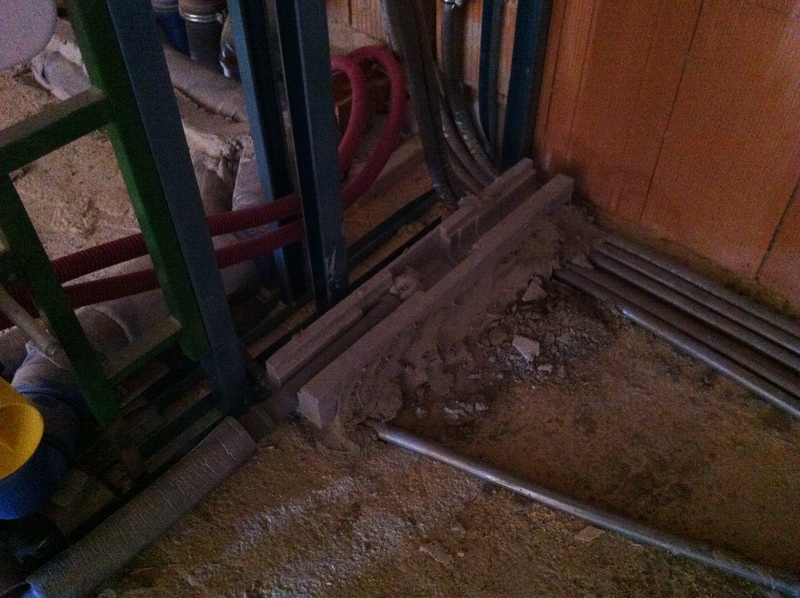 supporting structure. 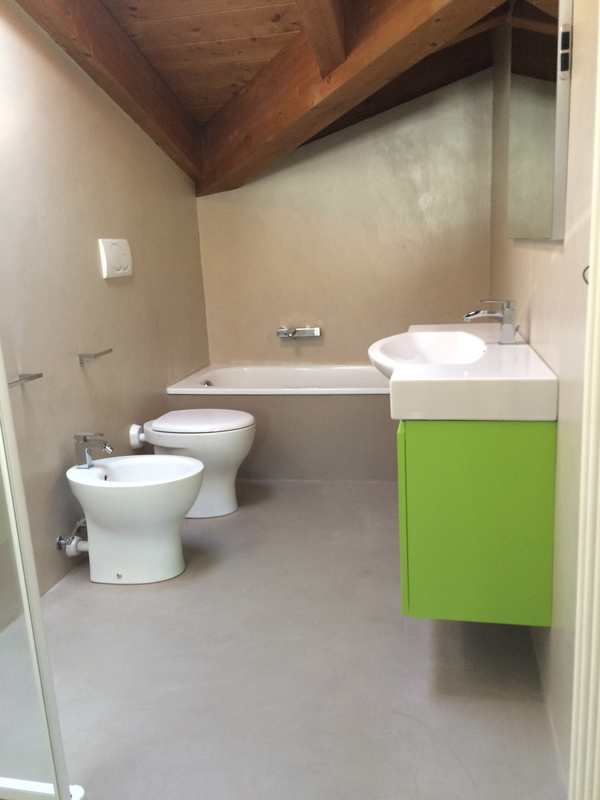 Seamless surfaces and a coordinated colour scheme for this house with a contemporary design. 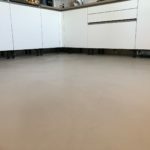 Far from just an assemblage of individual surfaces, this is a complete project featuring innovative materials — cement, resins, handcrafted wood, micro-coatings, paints — coordinated by a warm and fascinating palette of colors. 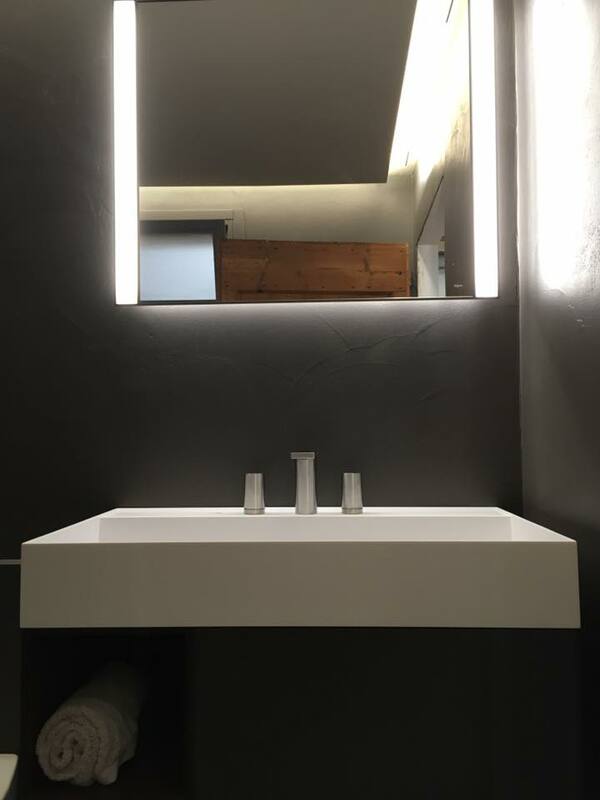 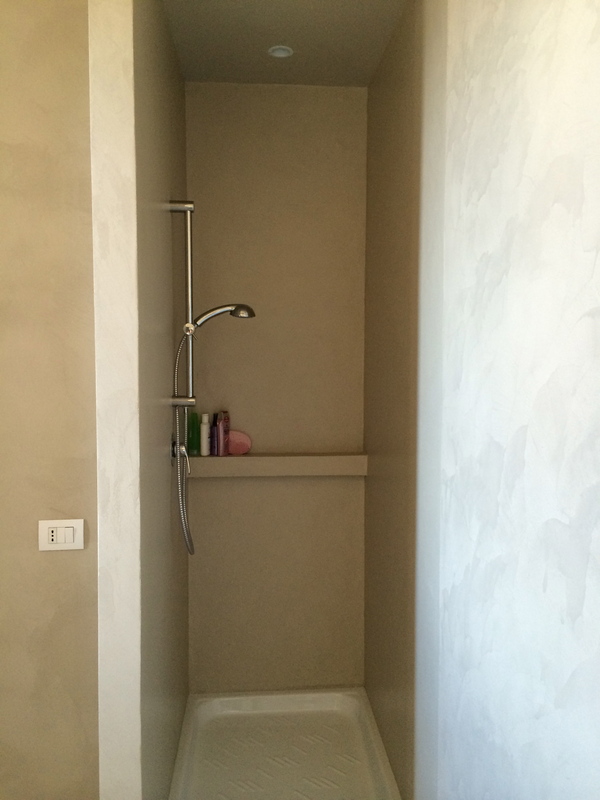 The bathroom has been realized by combining the walls finished in Cemento Crudo WR04 with a prefinished oak : the environment has been realized using a space as turkish bath, bathtub and shower with our fast “dry” technology , using plasterboard and polystyrene. 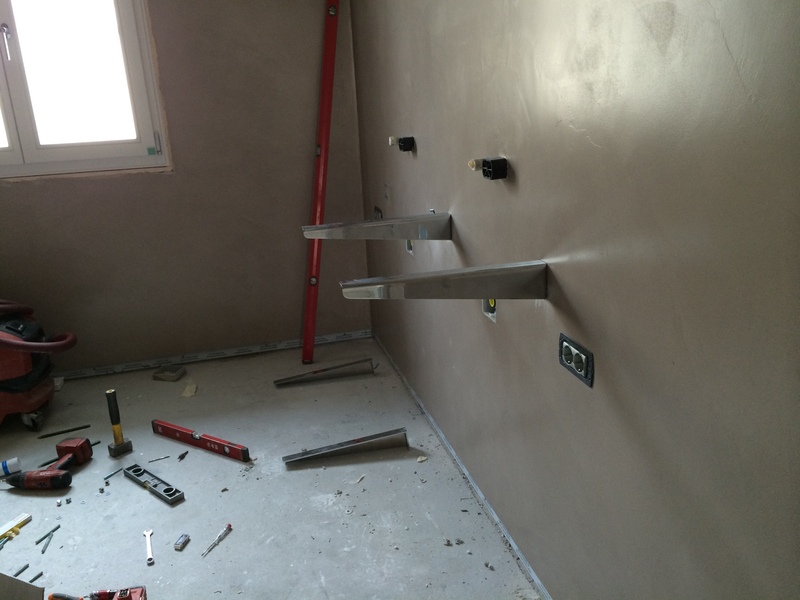 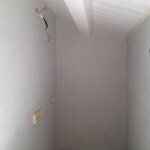 The result was a perfectly insulated space, planned also in the smallest detail and co with fast lead times and low costs. 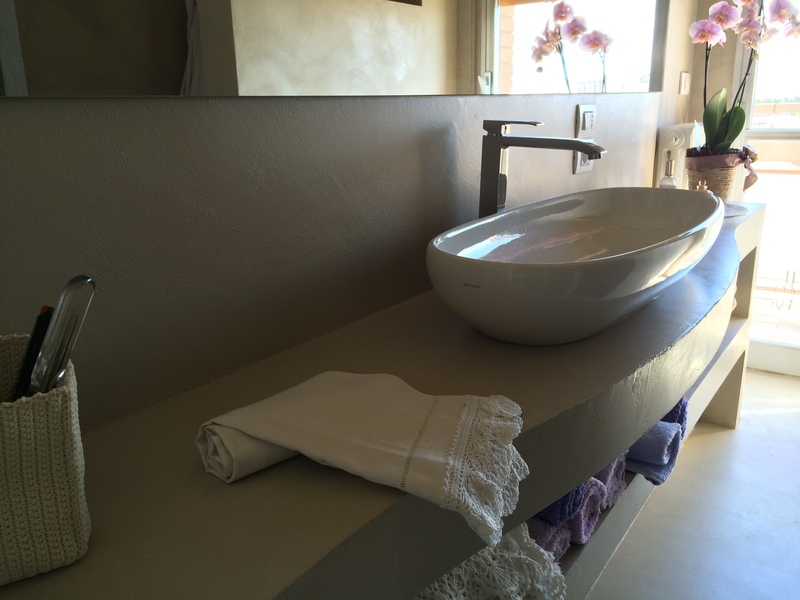 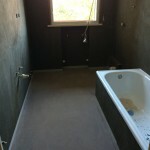 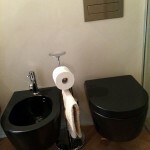 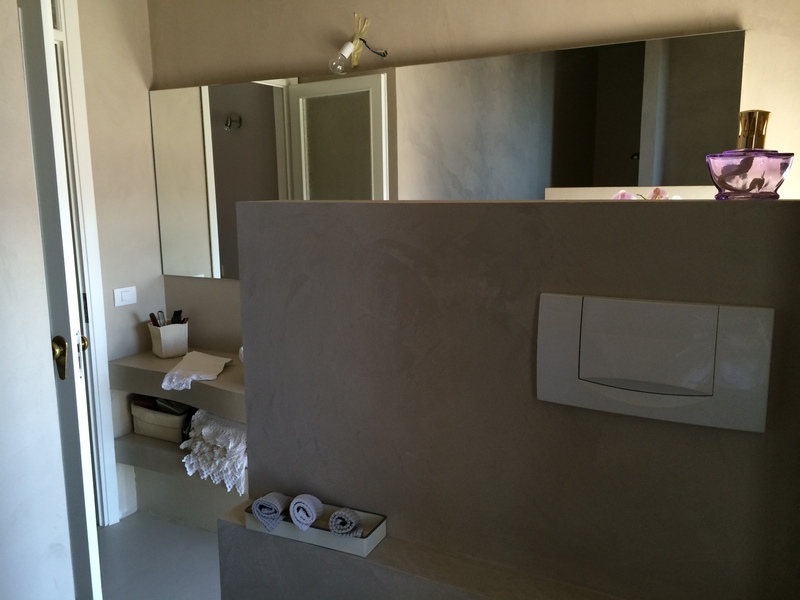 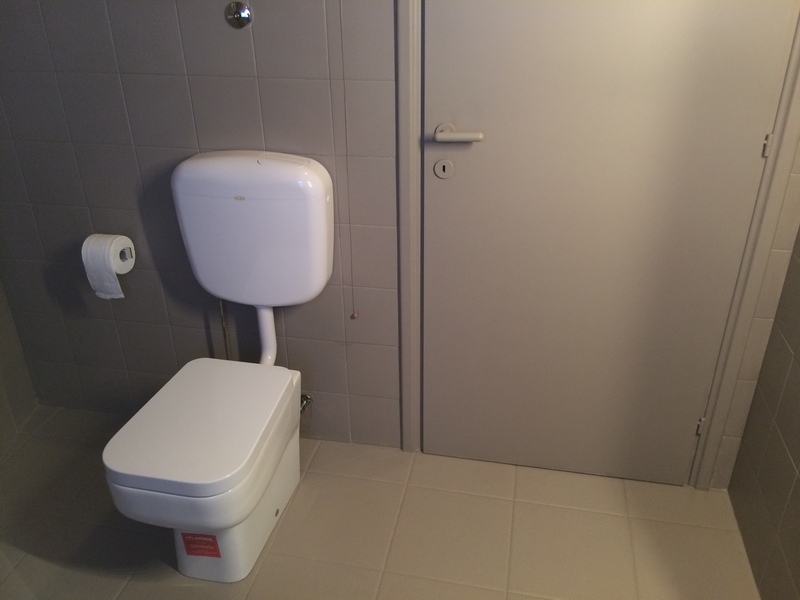 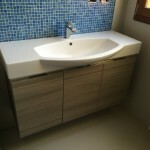 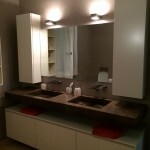 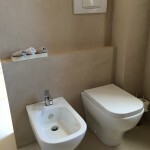 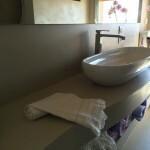 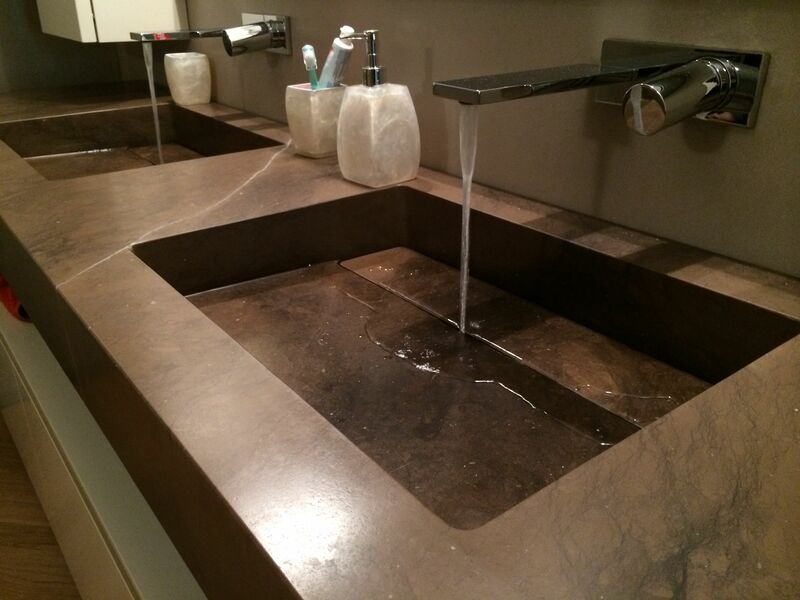 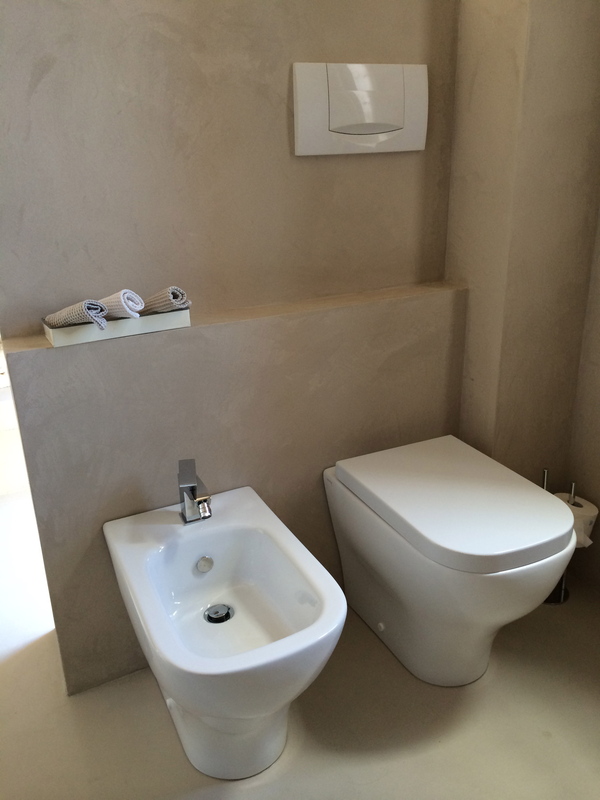 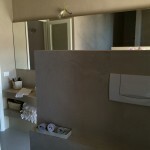 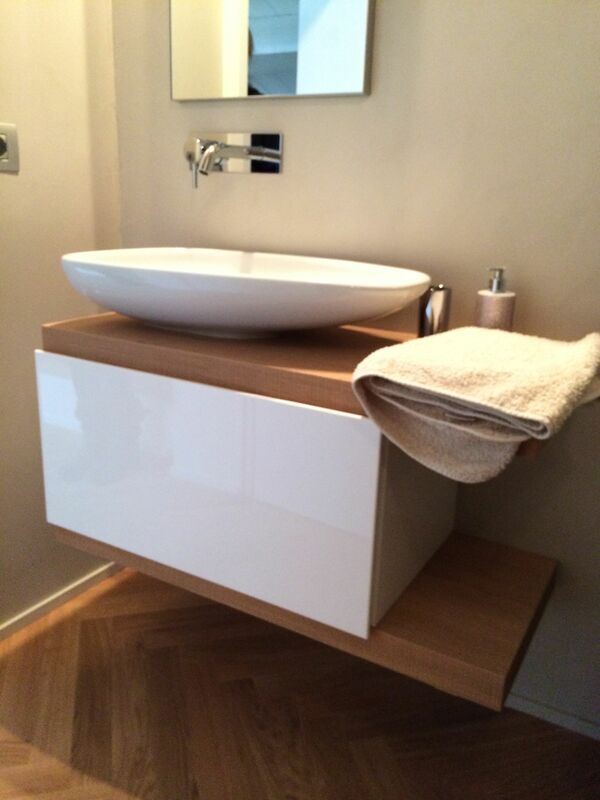 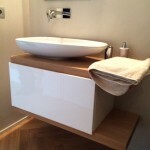 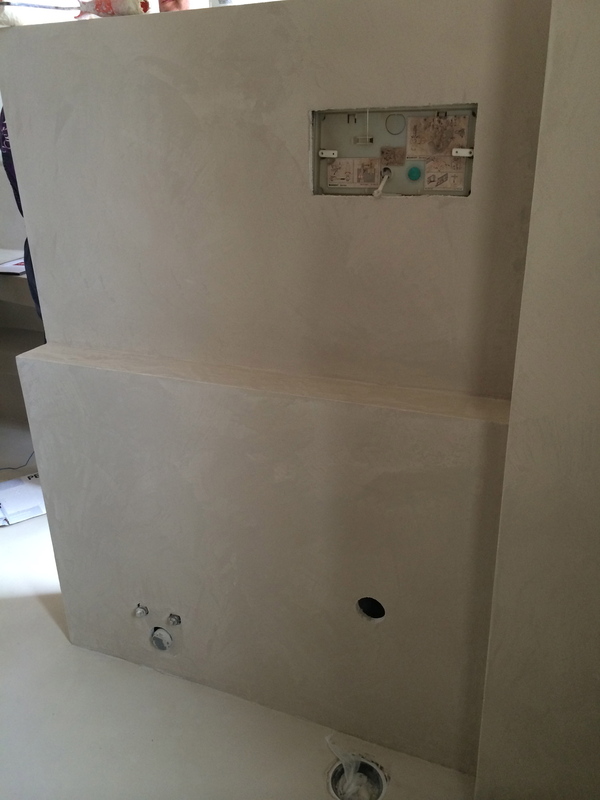 To complete colors and surfaces, Flaminia matt white wc and bidet, top “Ebano” Stone and Arcom Escape furnishing. 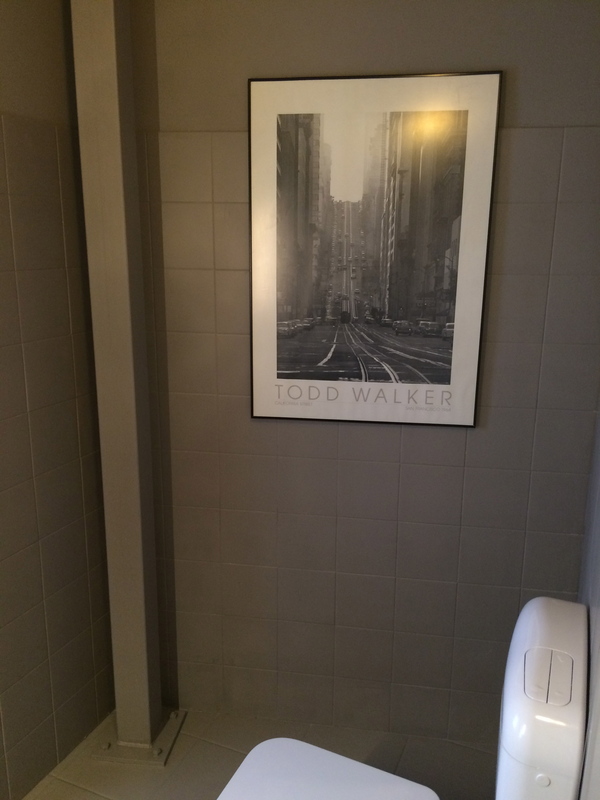 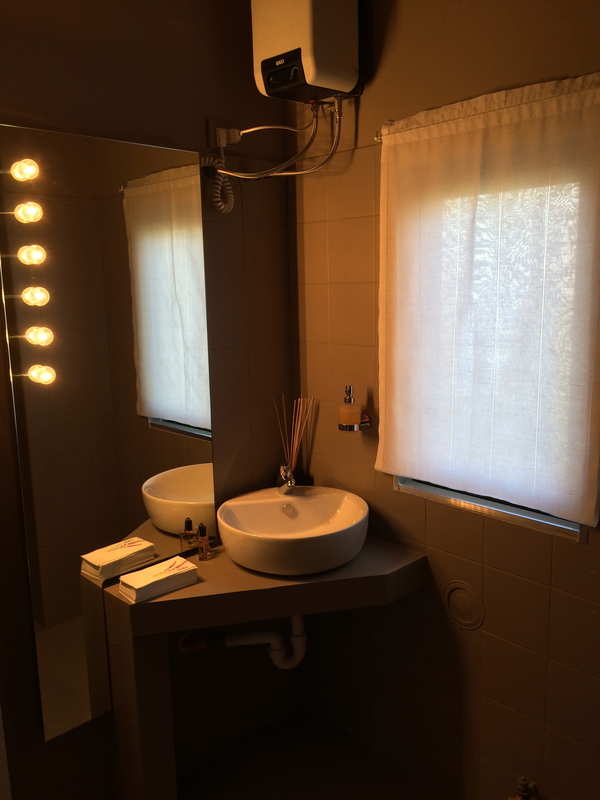 In this bathroom you can see the potential of Make up! 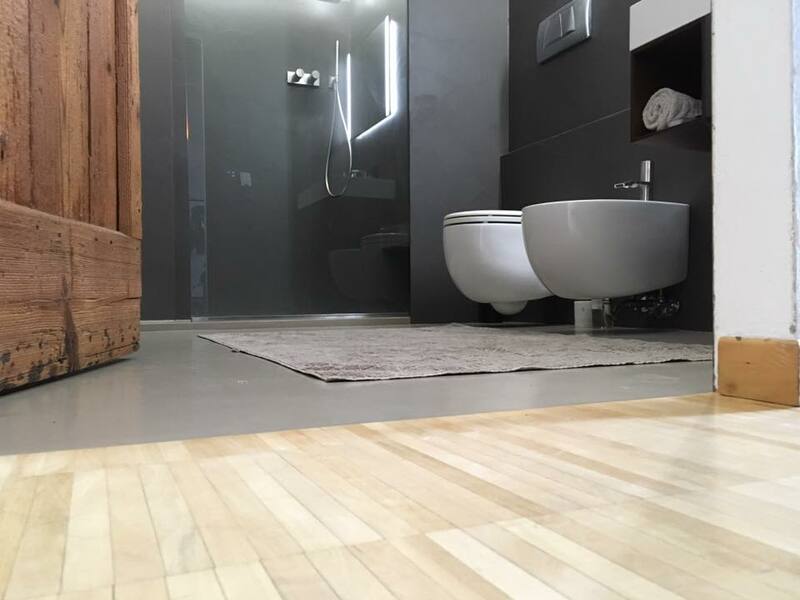 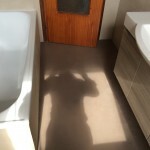 : A bathroom with no window, with ceiling wood has been finished with Cement Raw WR02 over walls, combining a parquet flooring with a 45° laid and a shower tray in porcelain stoneware. 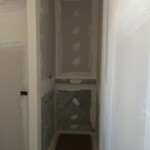 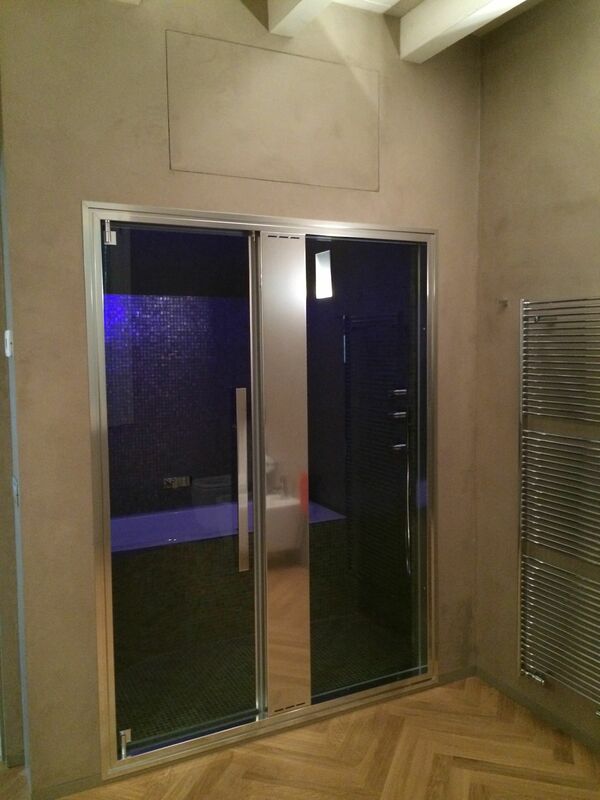 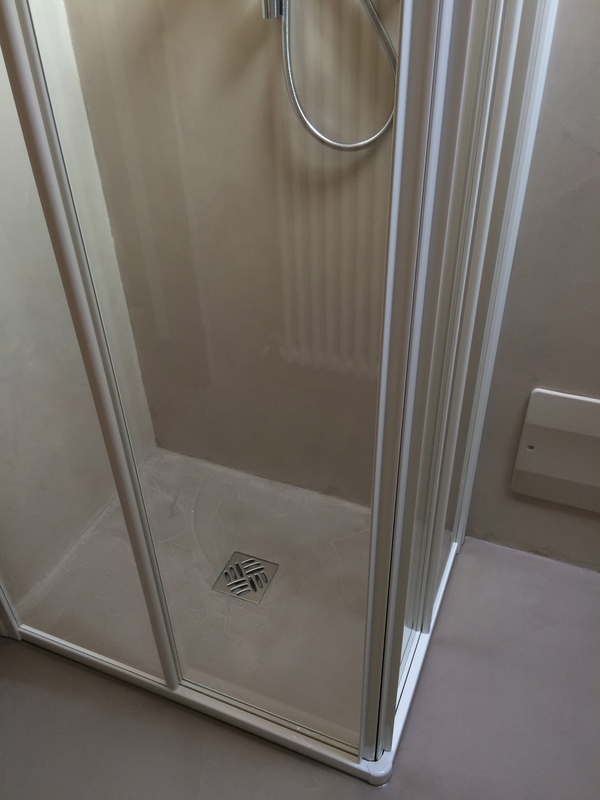 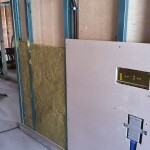 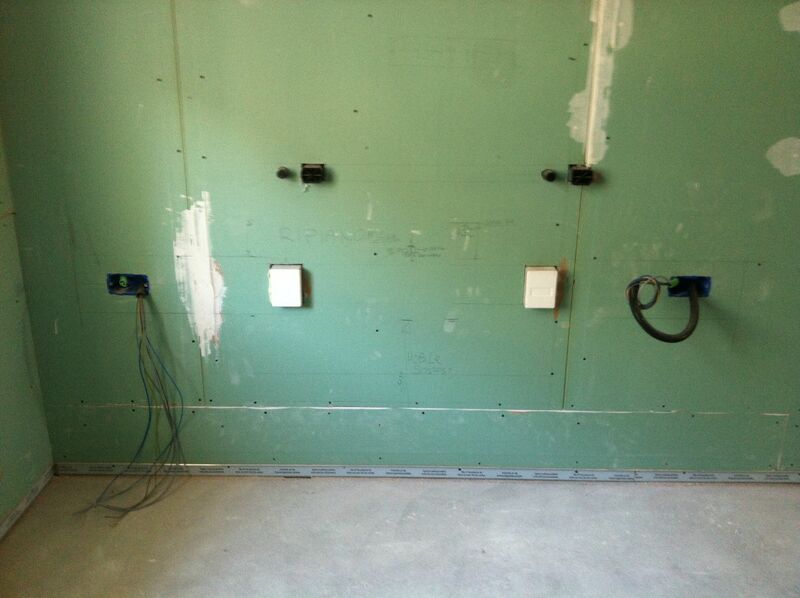 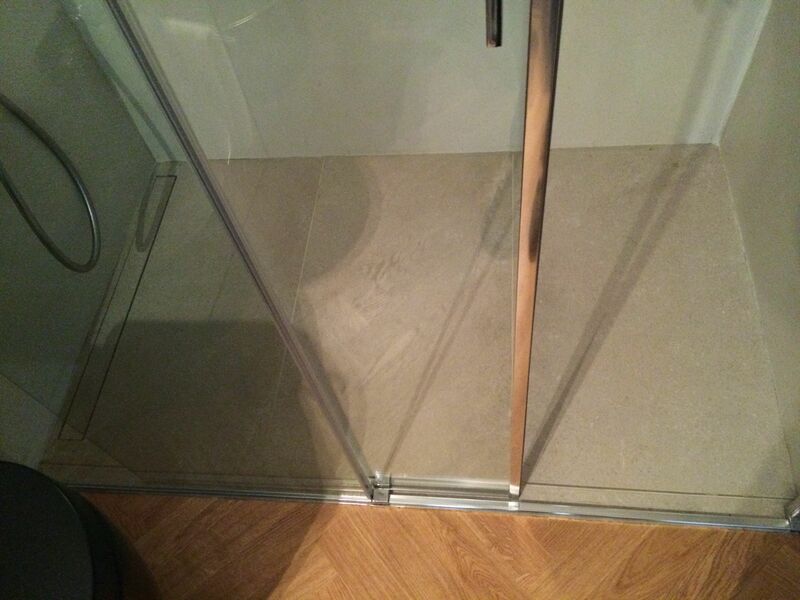 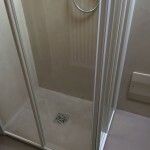 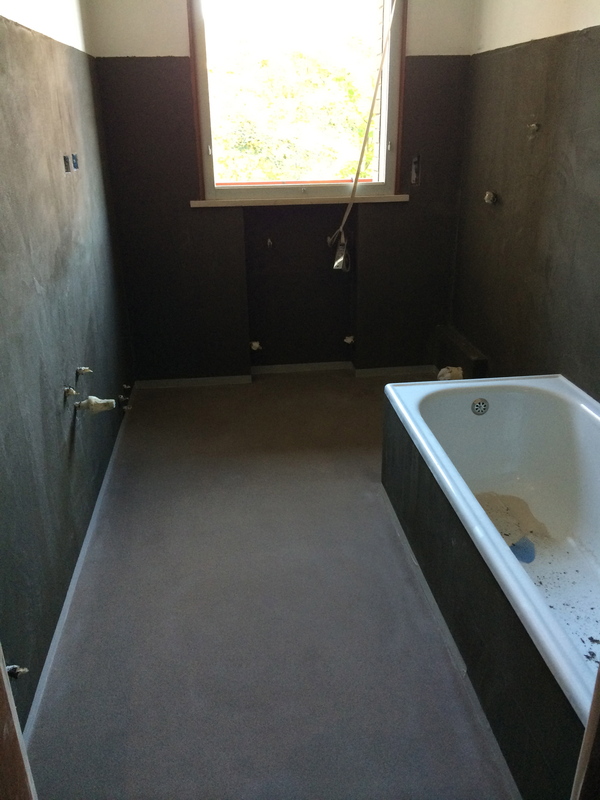 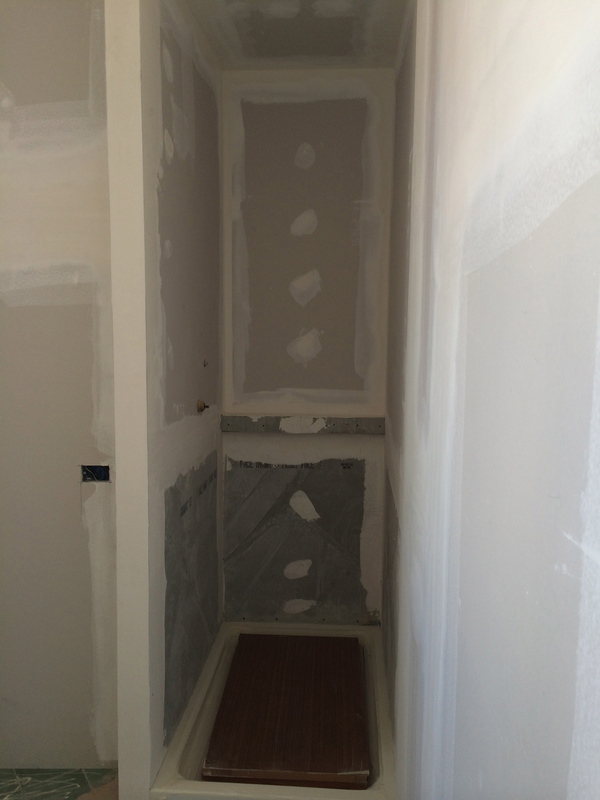 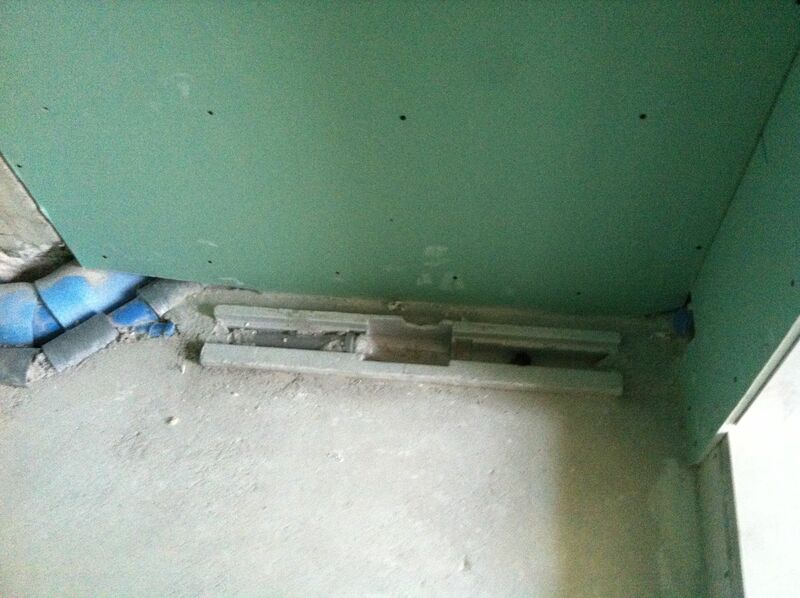 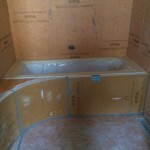 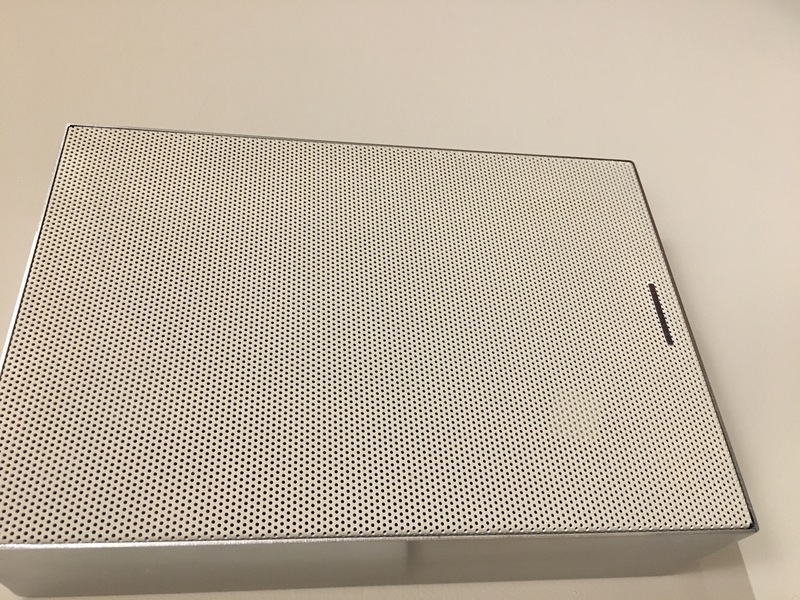 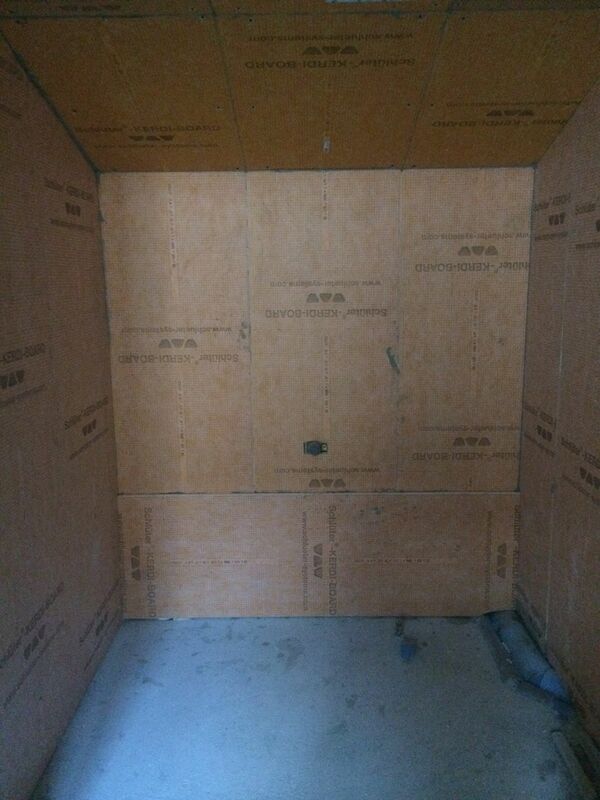 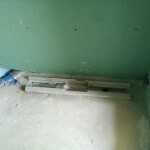 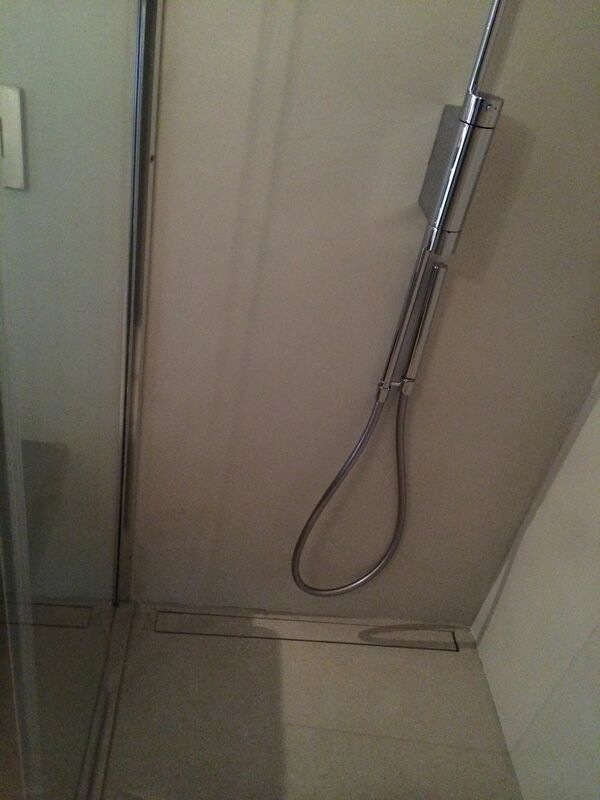 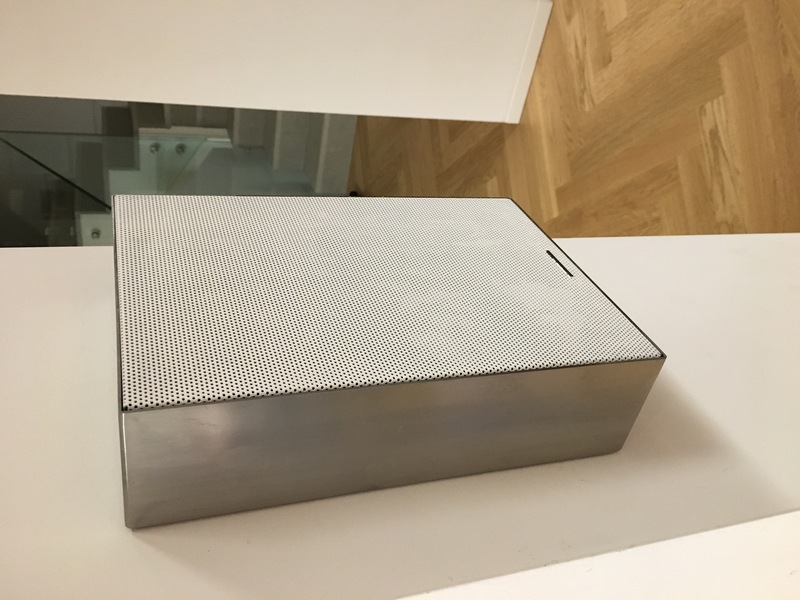 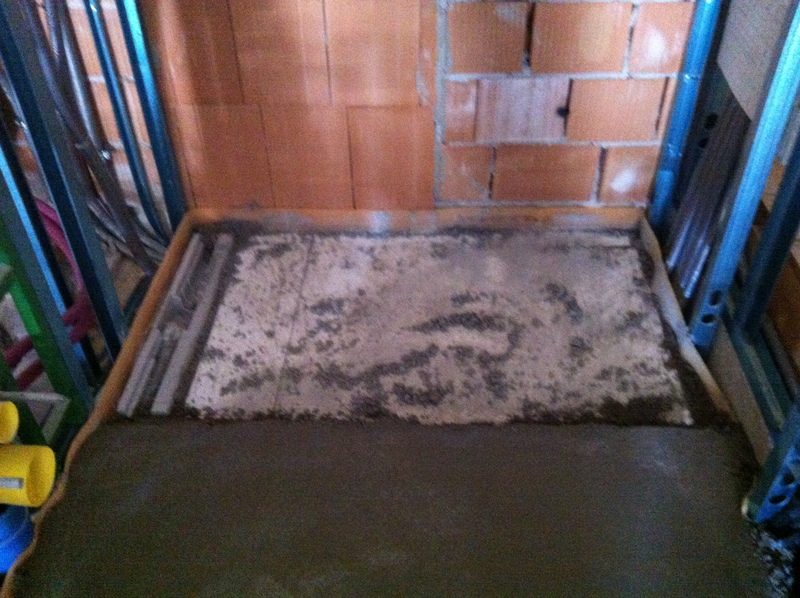 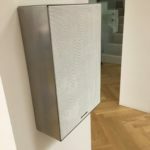 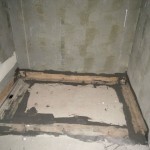 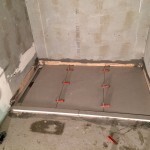 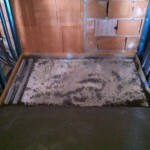 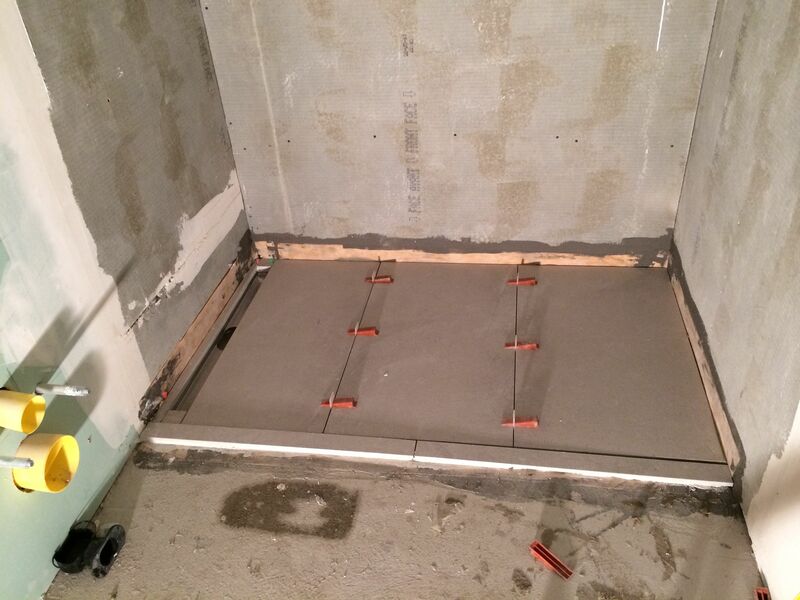 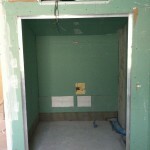 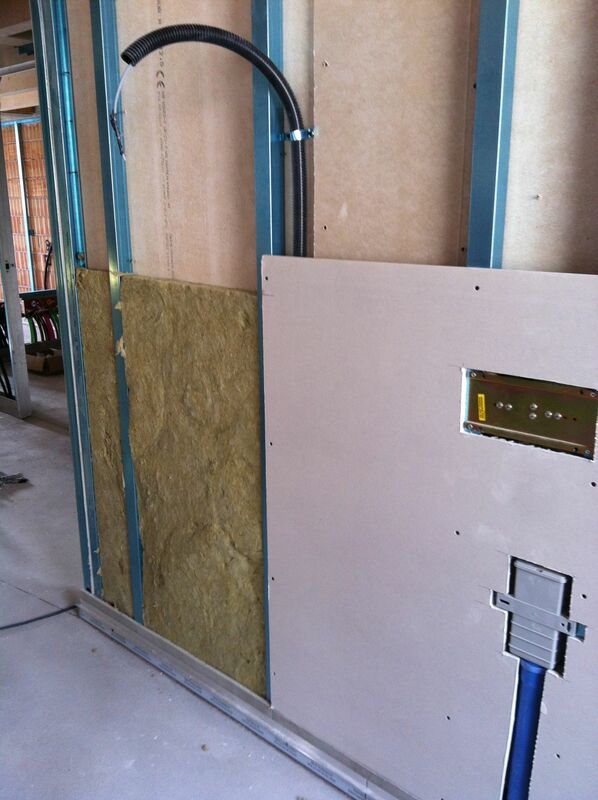 The shower tray has been prepared using the polystyrene shower tray and discharges flush with the floor by Schlüter Systems. 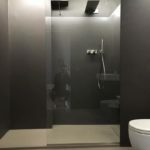 Fantini taps, Vismara Slide shower door, Brem anthracite radiator and Flaminia anthracite wc and bidet and bathroom furniture created with Tamblè Arcom are going to complete the project. 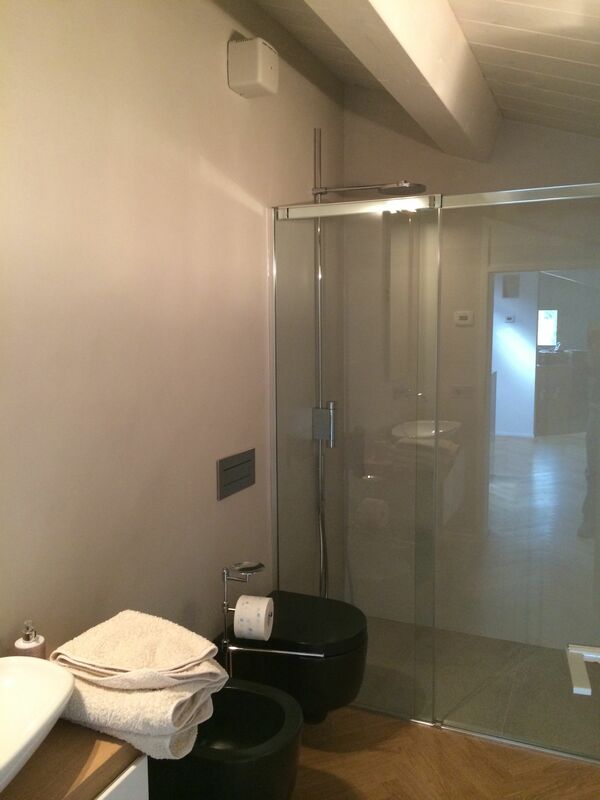 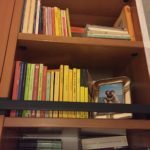 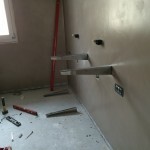 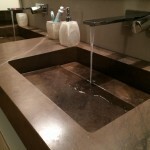 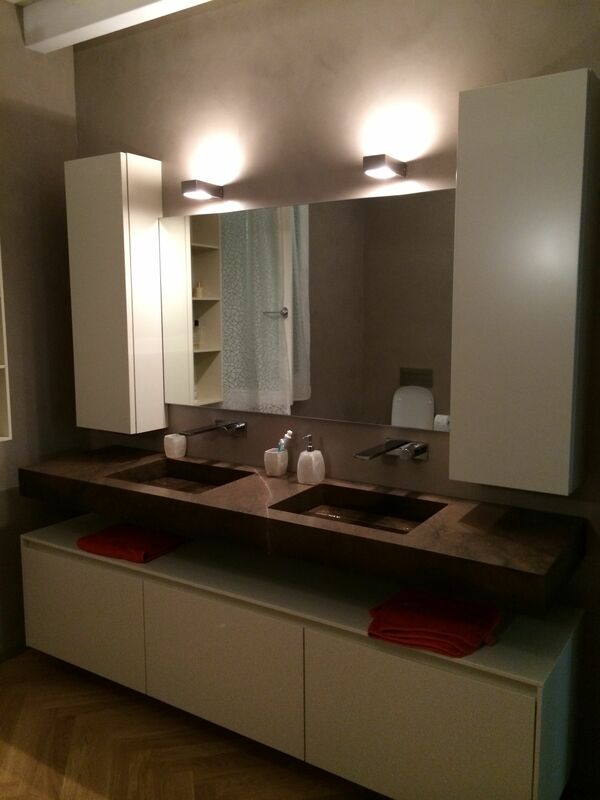 The project has been completely realized by IMMAGINI D’ARREDO. 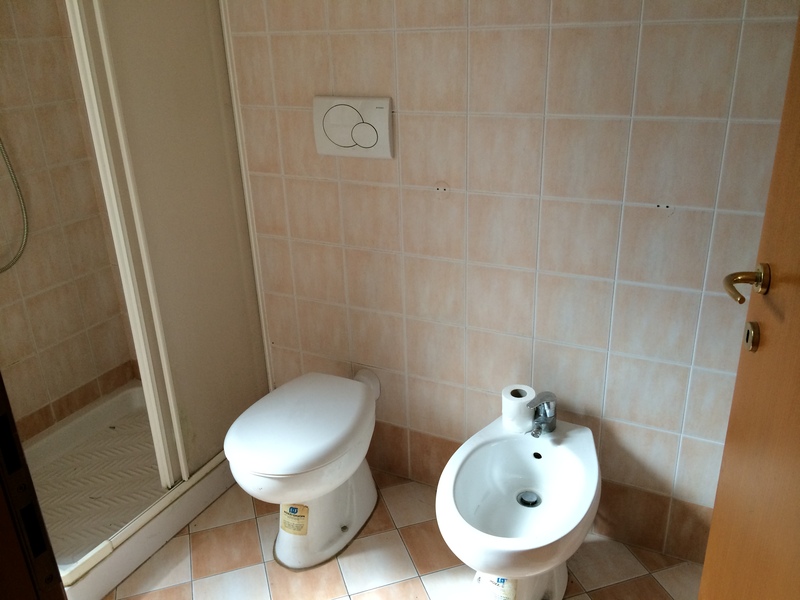 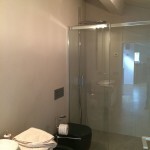 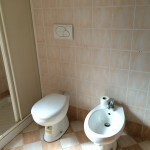 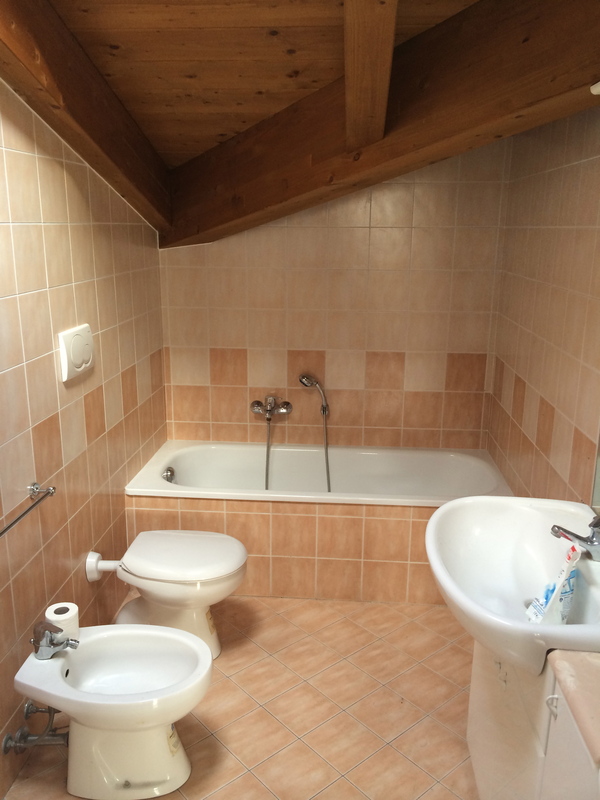 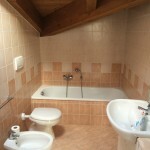 The bathroom photographed below is the result of a complete and fast makeover and with certain costs. 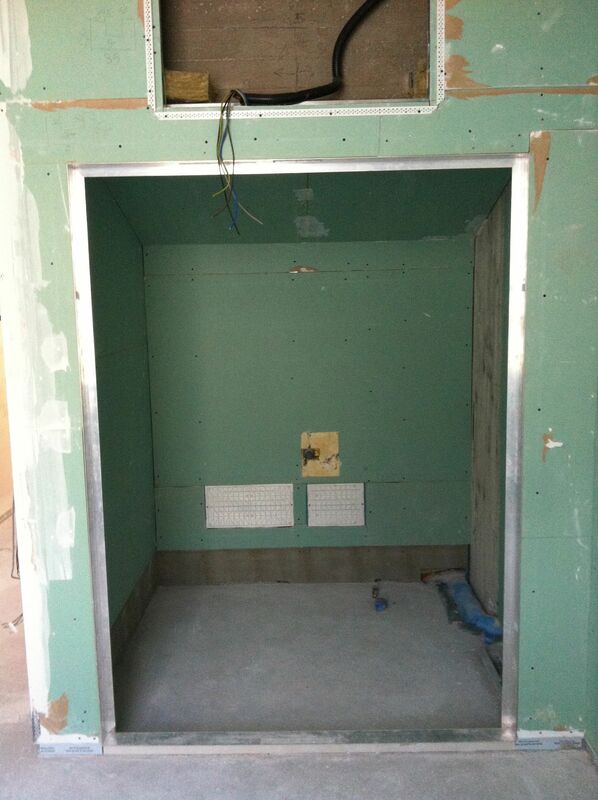 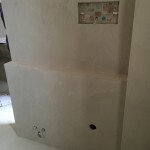 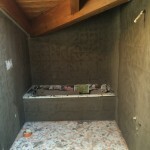 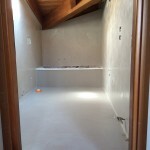 In the floor,You can see the laying of Cementoresina, while in the top and inside the shower are applied Cementoresina and ocìver walls and ceiling the finishings arePatina and Paint. 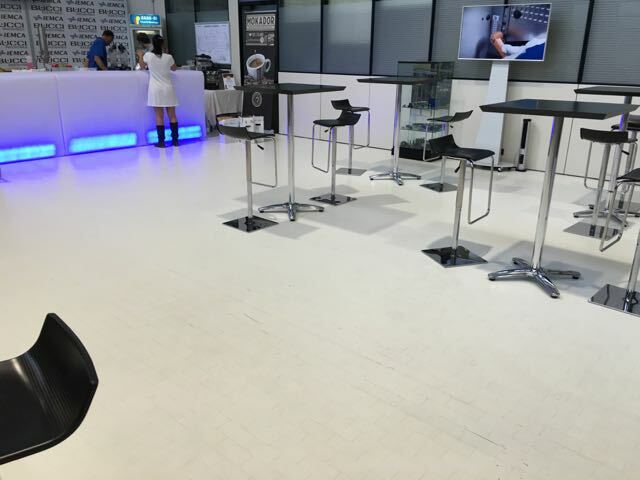 Thus, always with WR03 color , it has been possible to calibrate cost and the time according to the expectations. 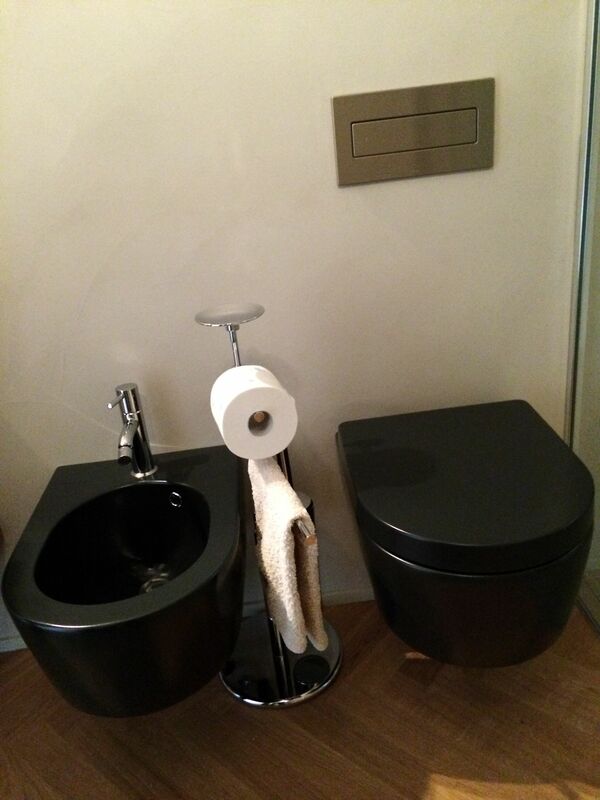 In support, we have combined sanitary and plumbing. 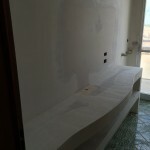 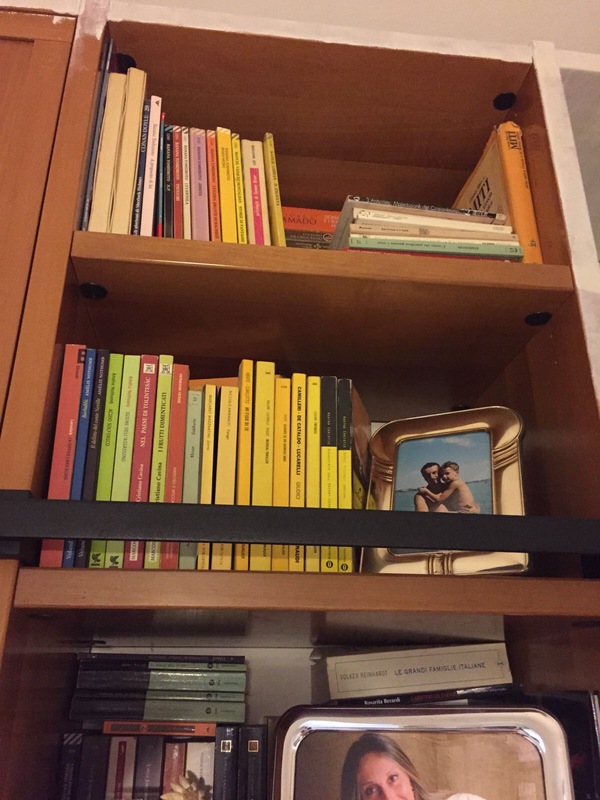 Even this environment has been realized by IMMAGINI D’ARREDO. 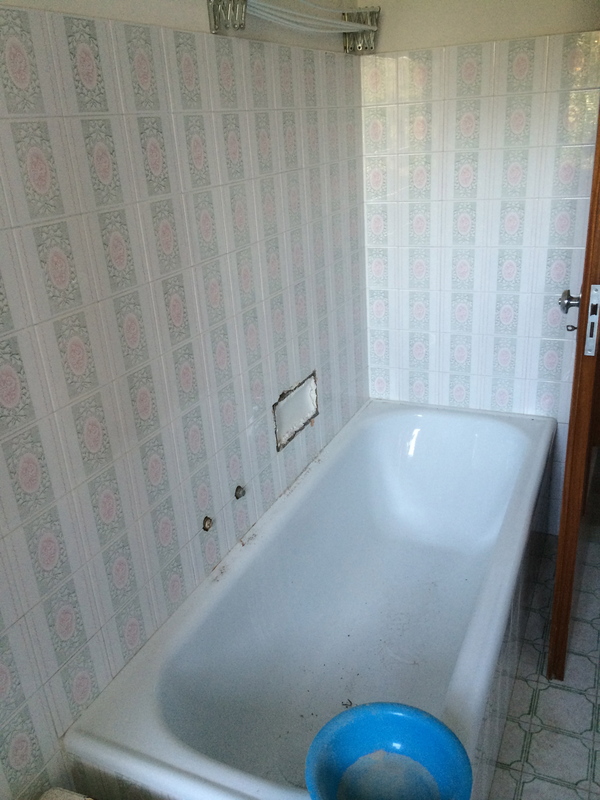 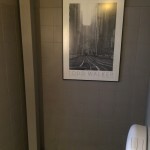 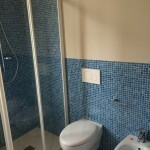 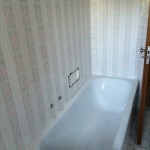 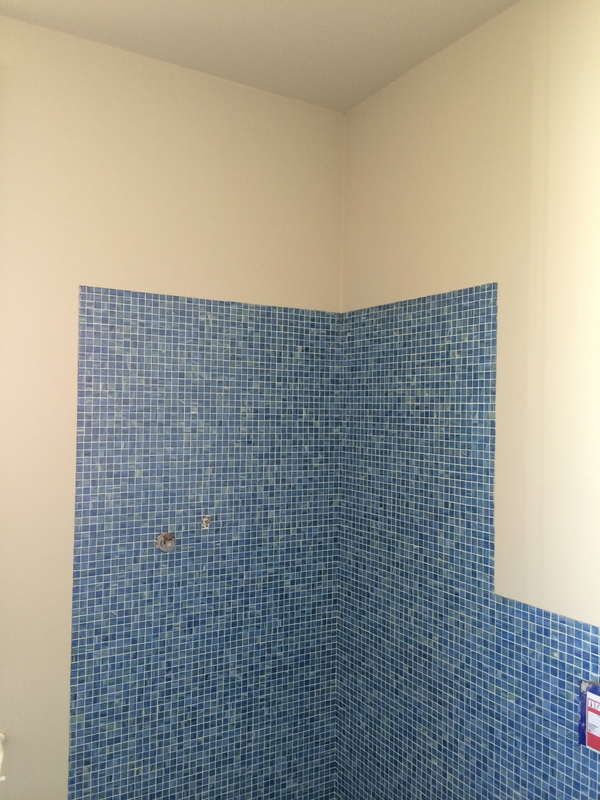 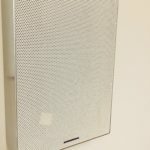 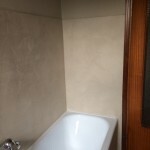 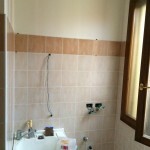 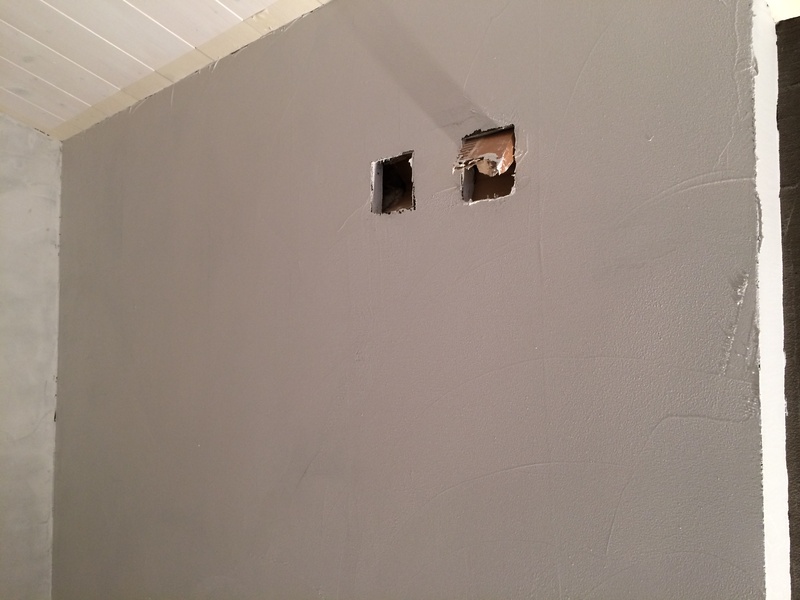 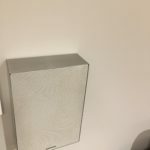 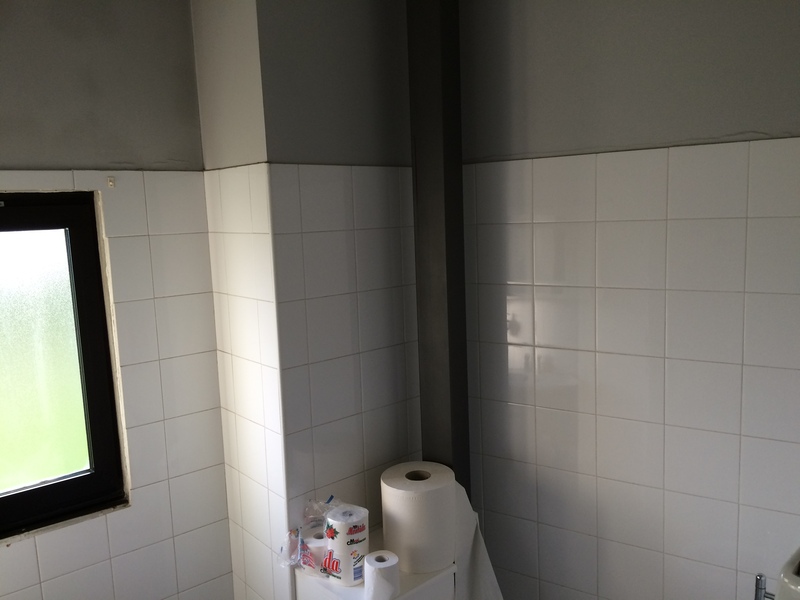 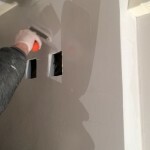 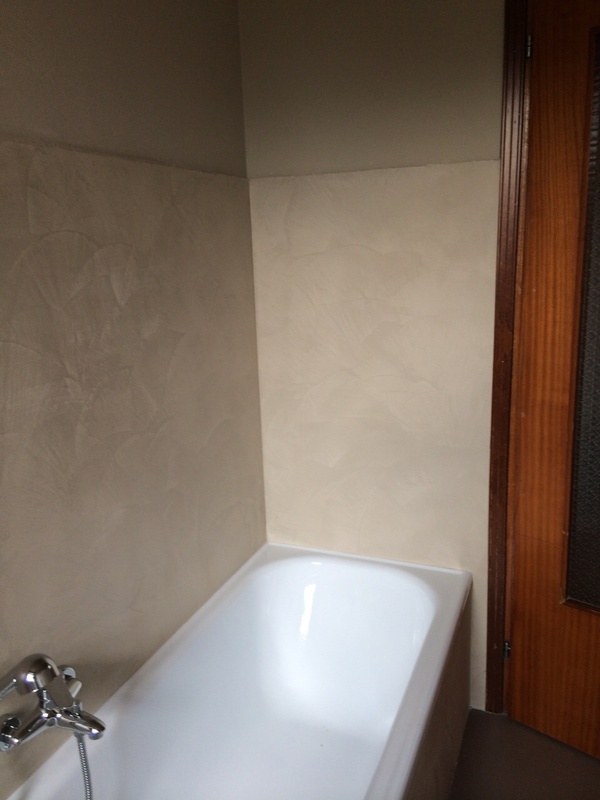 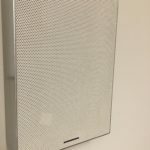 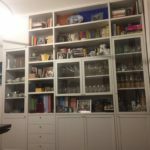 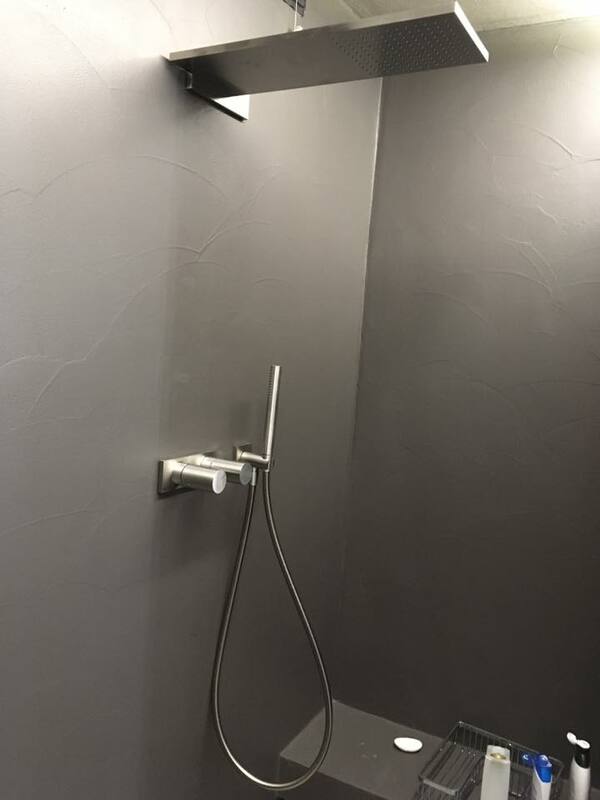 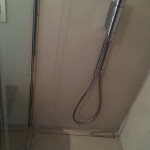 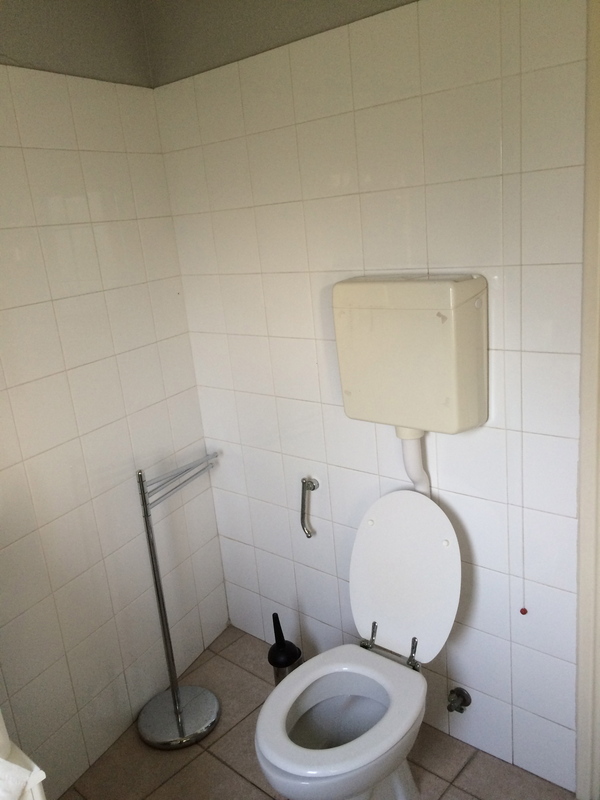 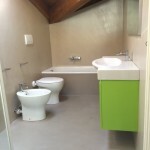 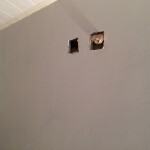 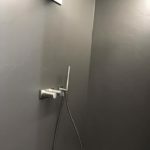 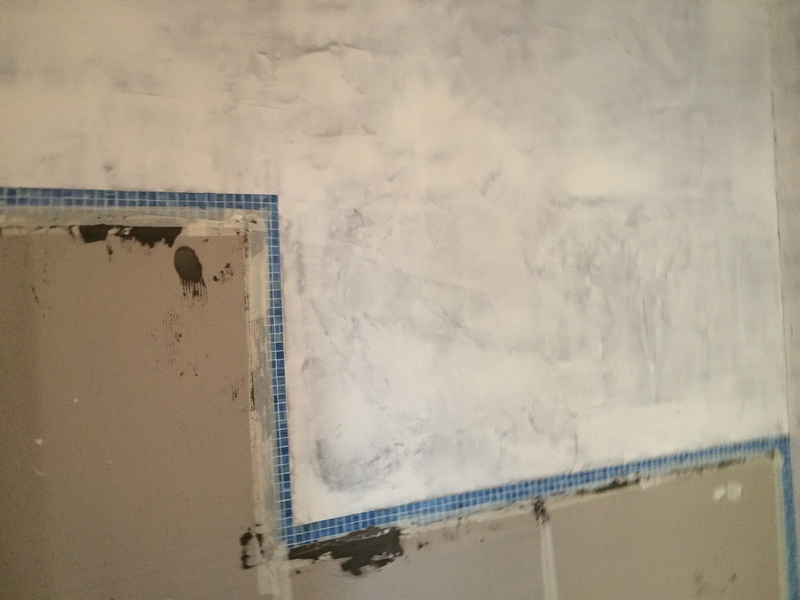 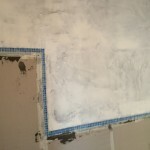 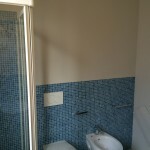 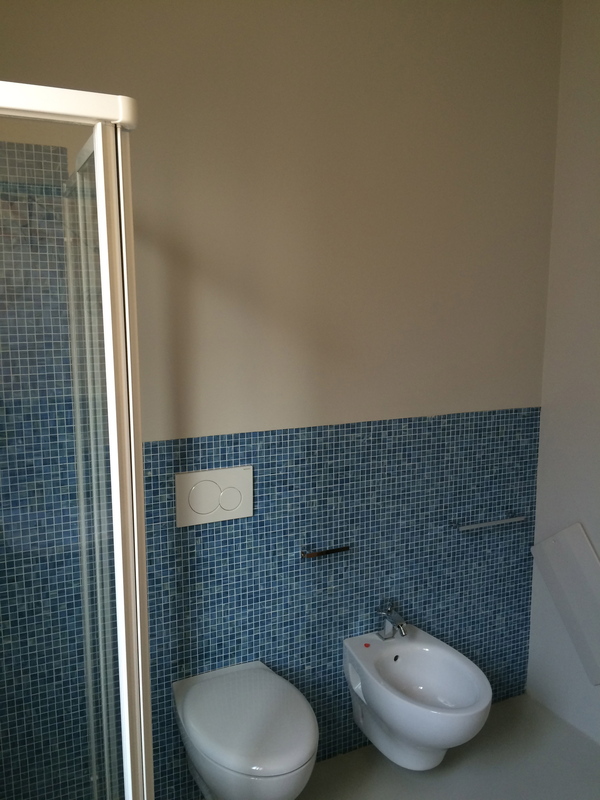 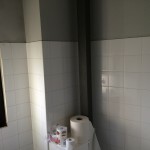 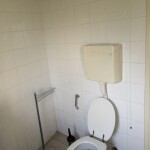 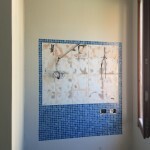 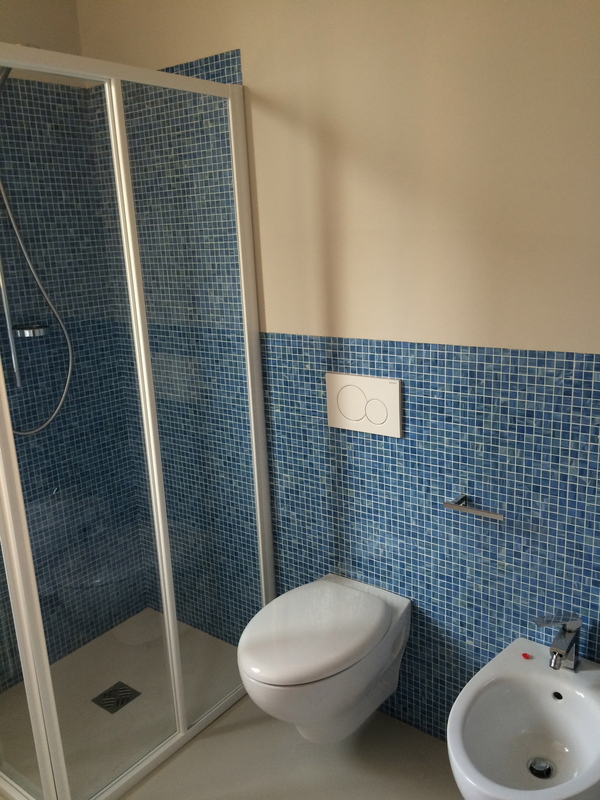 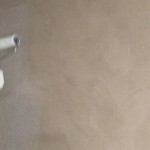 These pictures are taken from the restyling of a bathroom completely covered in ’70s style ceramic tiles: the aim was to give a completely new look, with reduced cost and time of realization. 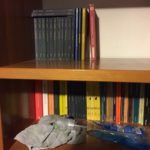 Target reached! 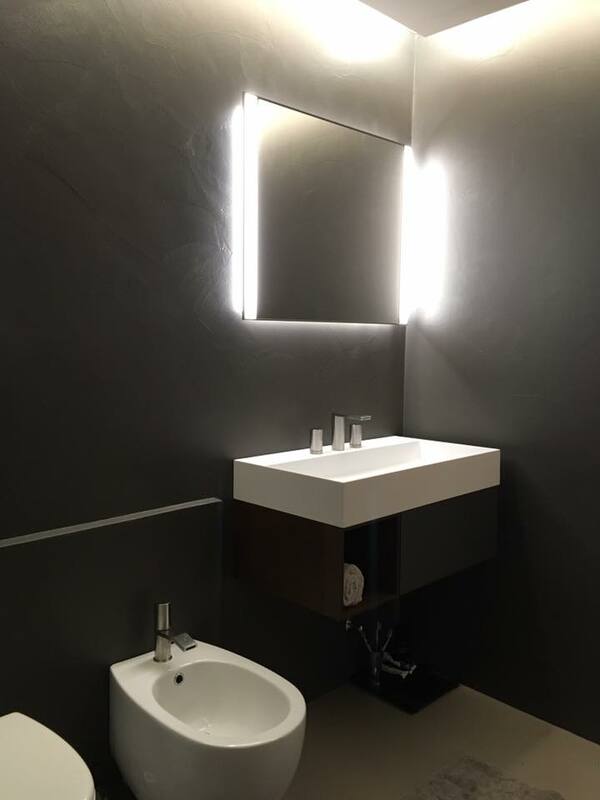 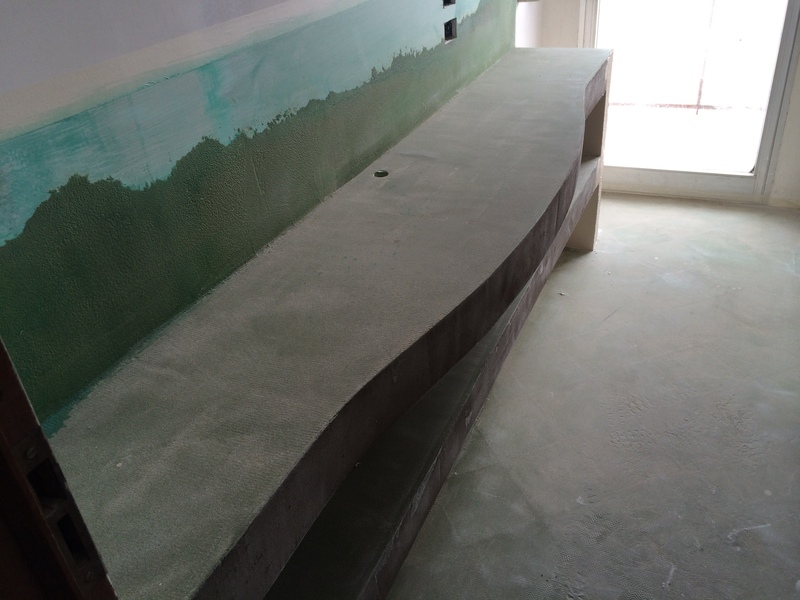 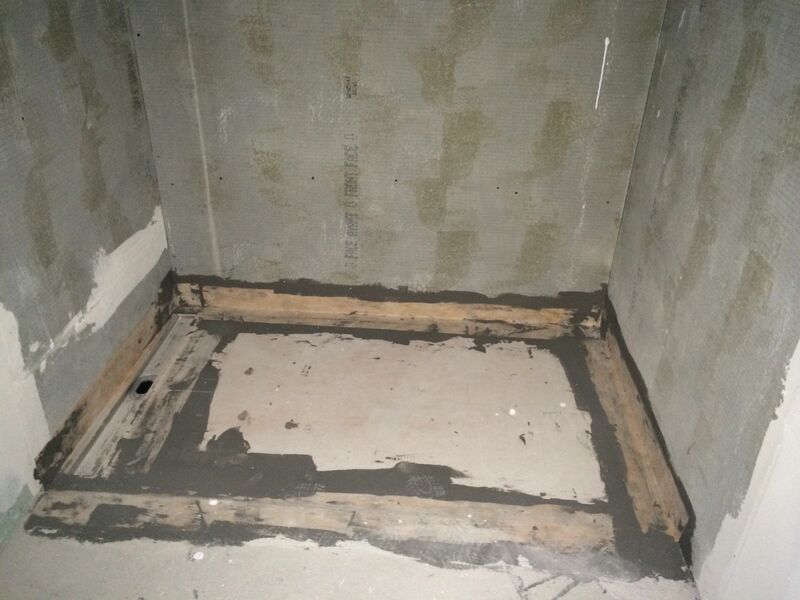 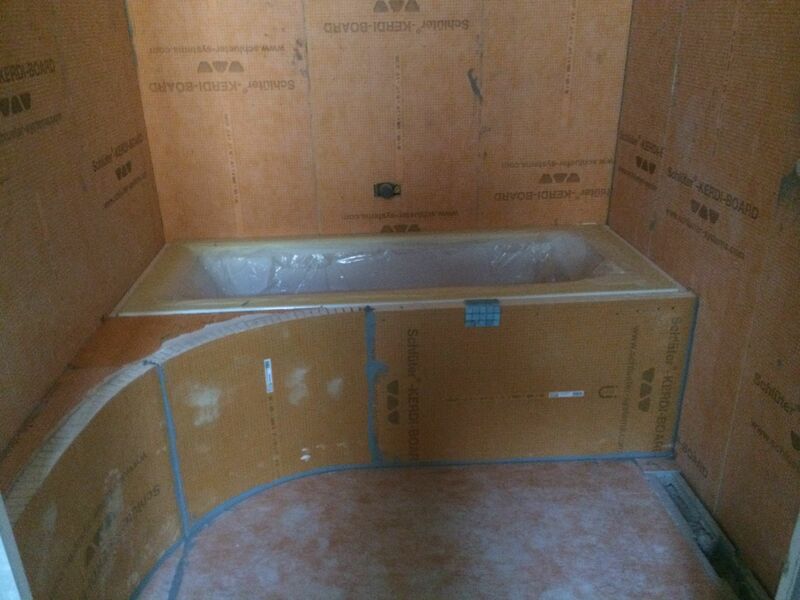 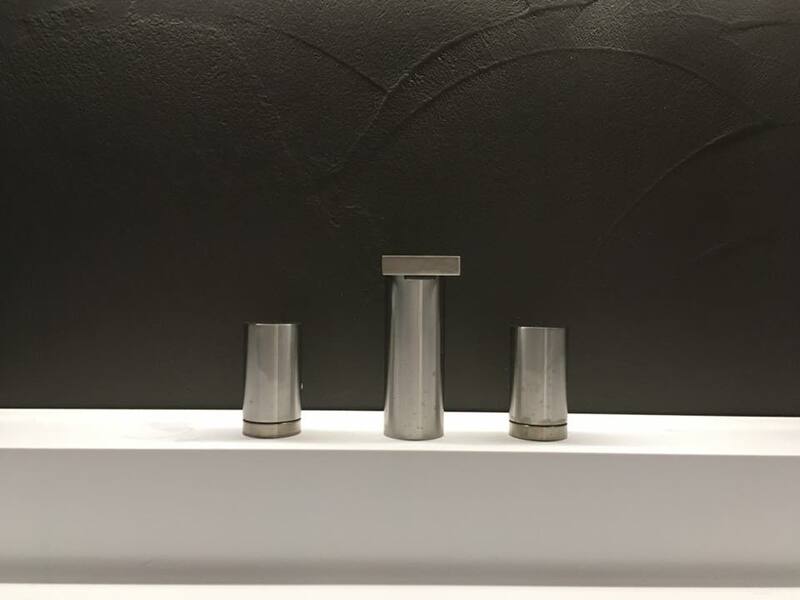 The renewal of this environment has been rapid, although the preparation for the implementation of continuous surfaces was more complex: Changing health-standing predisposition to suspend position, construction of floor level shower tray, modification of the water drain sink area .. 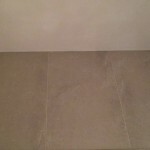 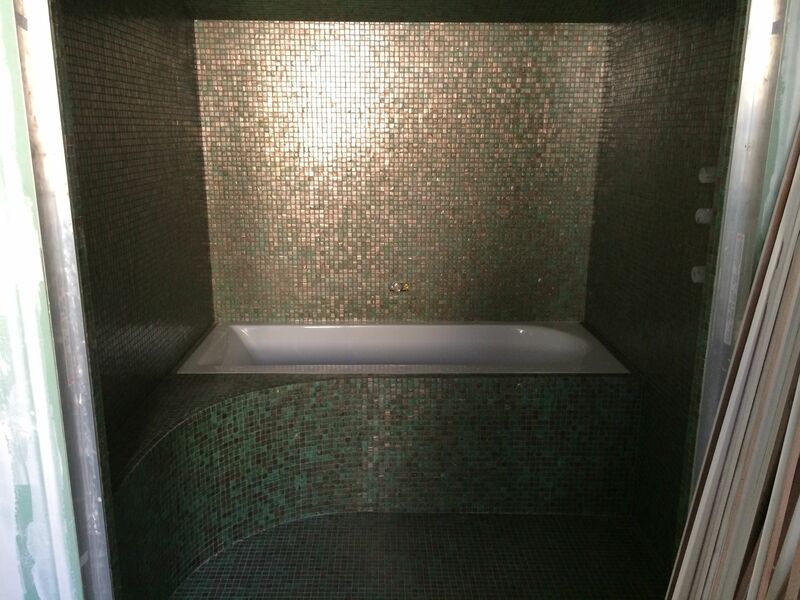 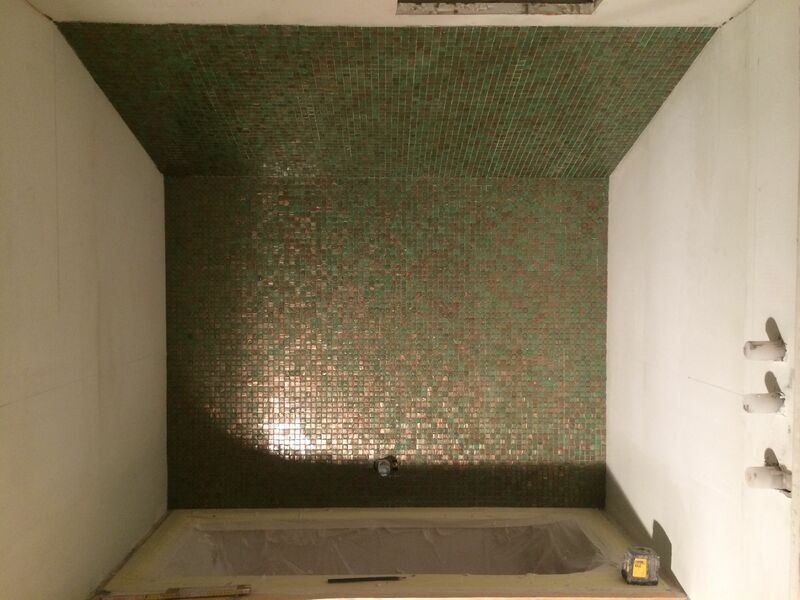 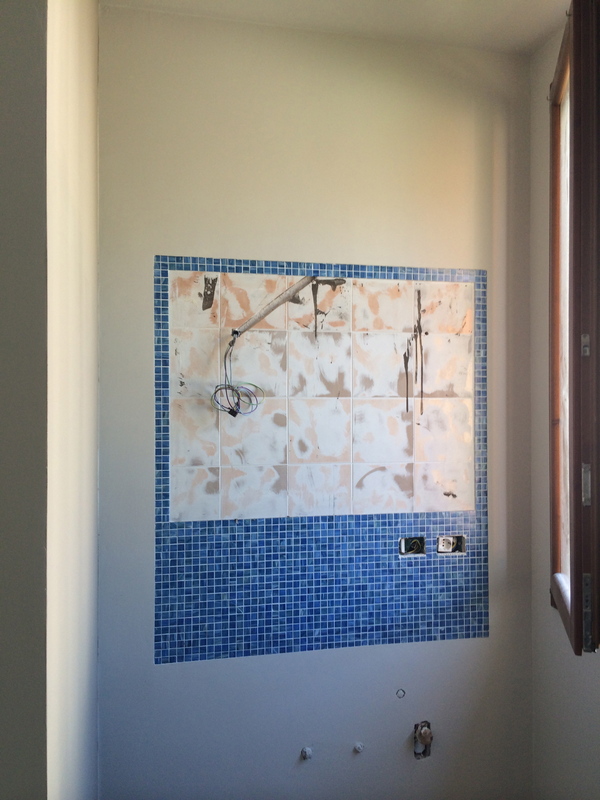 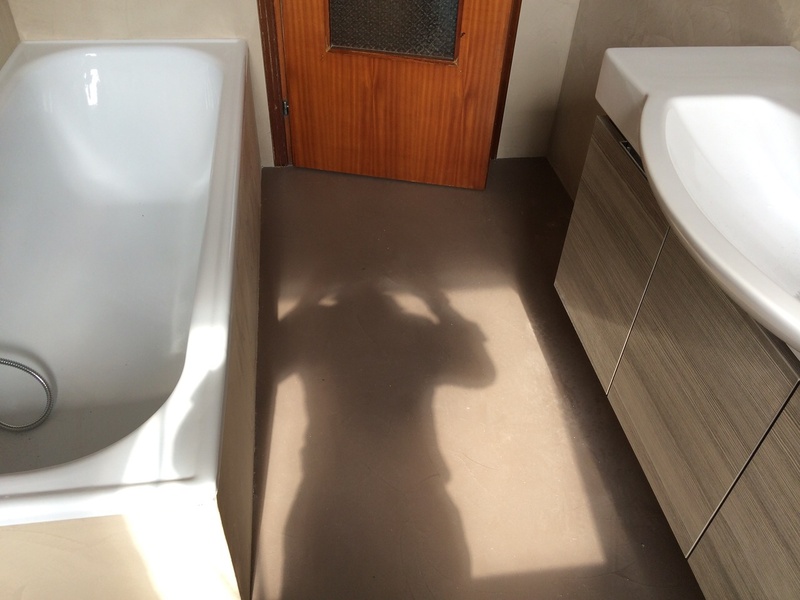 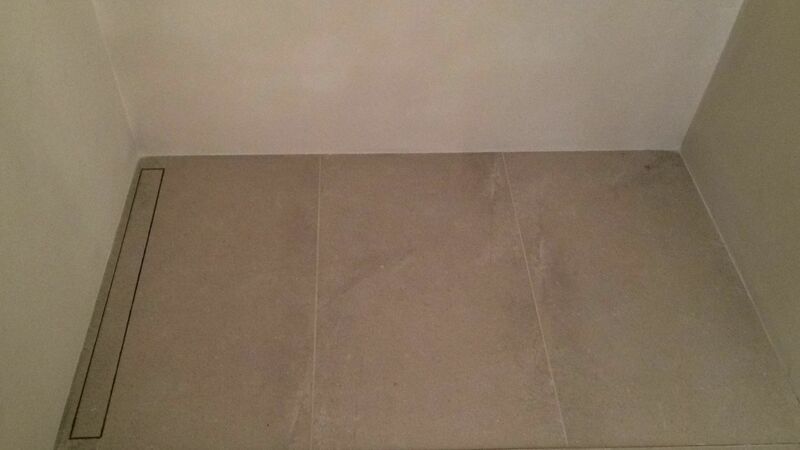 In a total of 10 days of work we were able to completely cover the bathroom, not creating “steps” between existing floors and Cementoresina, creating a floor level R11 antislip shower tray into the same texture and color as the rest of the bathroom, combining a 1,5×1,5cm mosaic by Trend to Paint, the siloxanic painting up to ceiling and of course including the water supply and pose sanitary: from the city Gsi sanitary, to the Tda shower, from the Paffoni taps Level to Arcom Mobile E’GO . 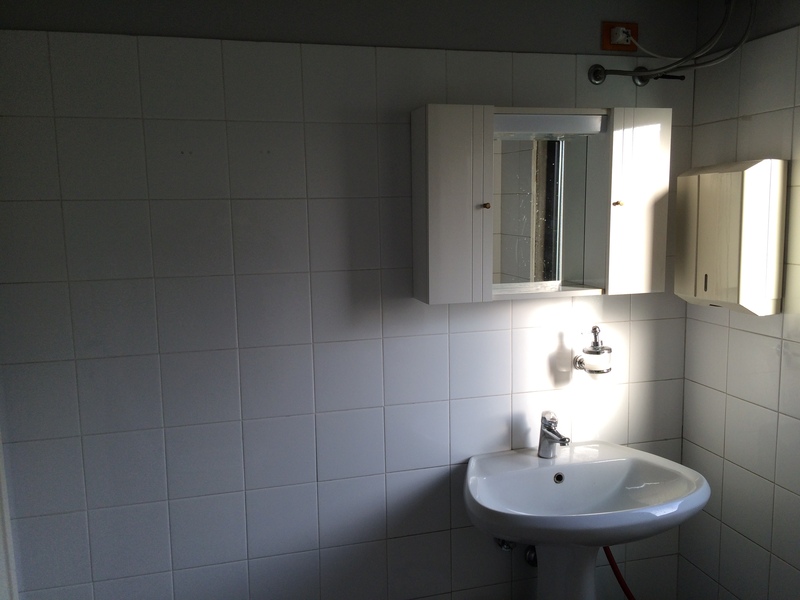 An environment certainly made in fixed times and costs with our Make up! 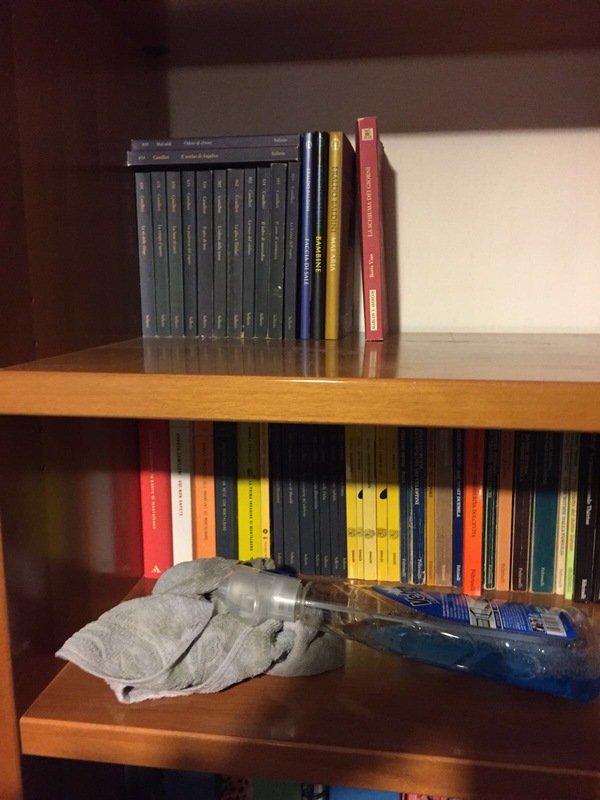 program . 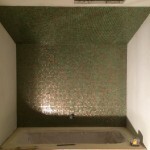 A classic bath tub in the attic completely covered in ceramic “transformed” in a few days in a bath of more modern style while keeping warm colors and tones. 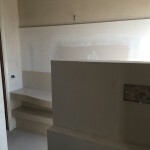 “Cementocrudo” into the wall and “Cementoresina” on the floor are perfectly compatible ensuring robustness and practicality. 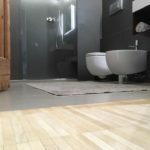 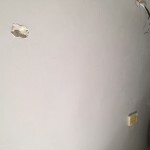 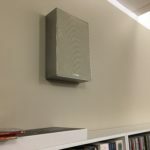 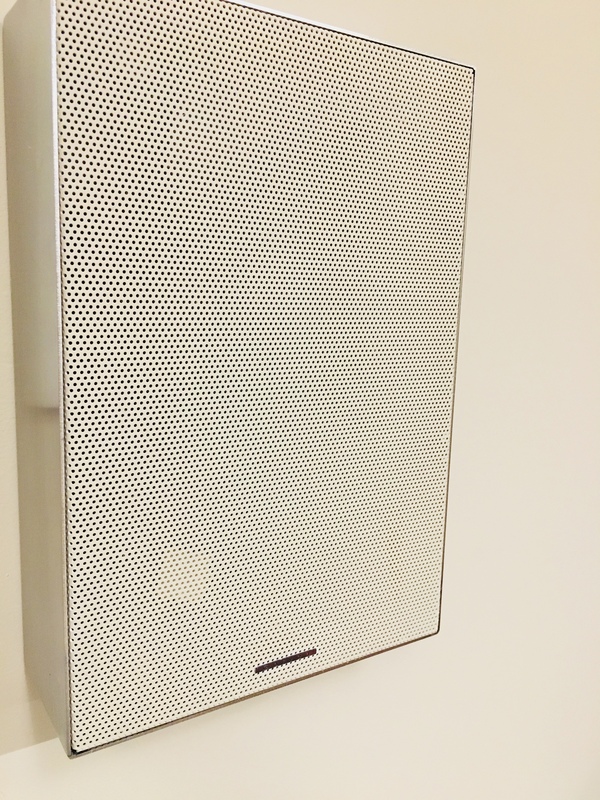 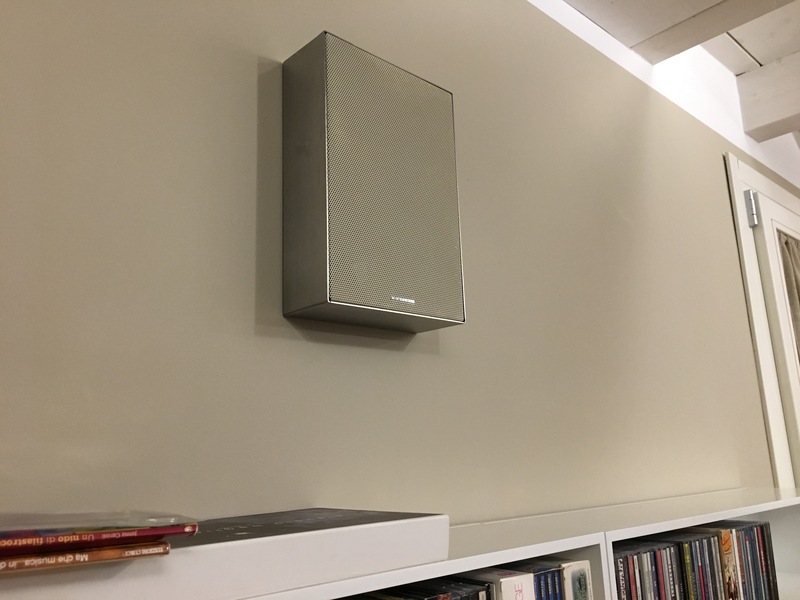 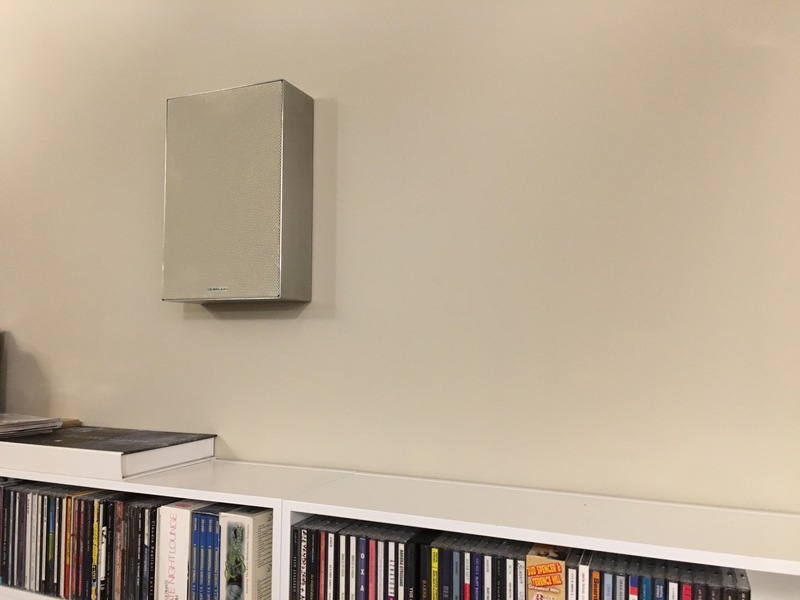 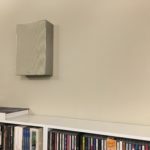 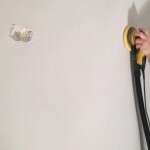 A (Re) design that is fast, quiet and much less invasive and expensive instead of the classic renovation. 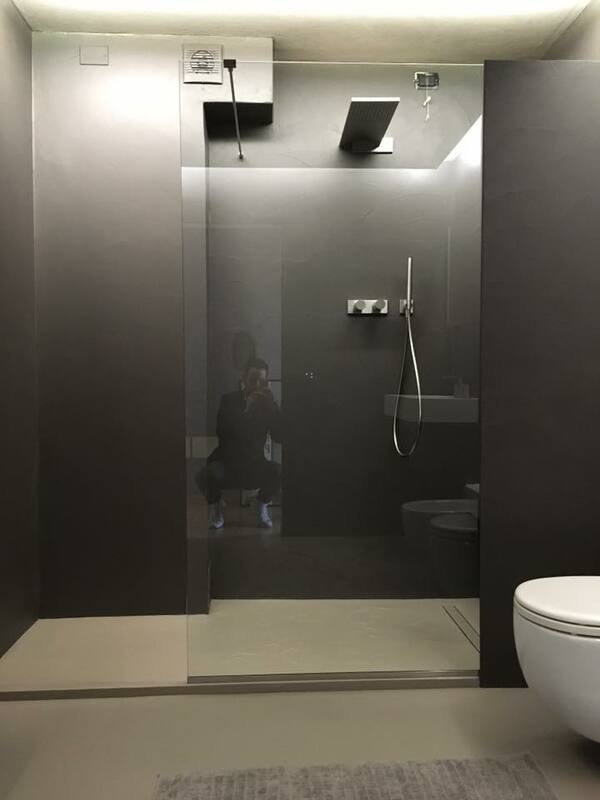 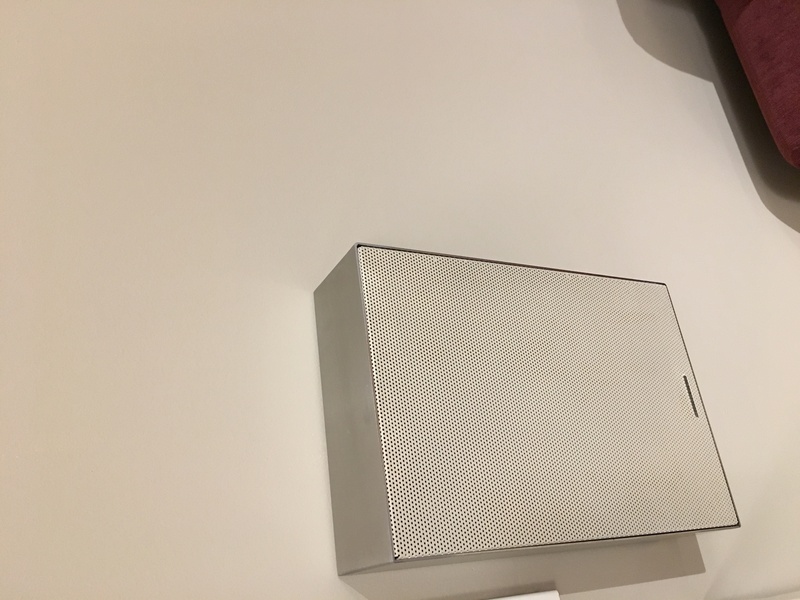 Microresina for walls and floor allows you to make a bathroom environment restyling in very short times and very low costs . 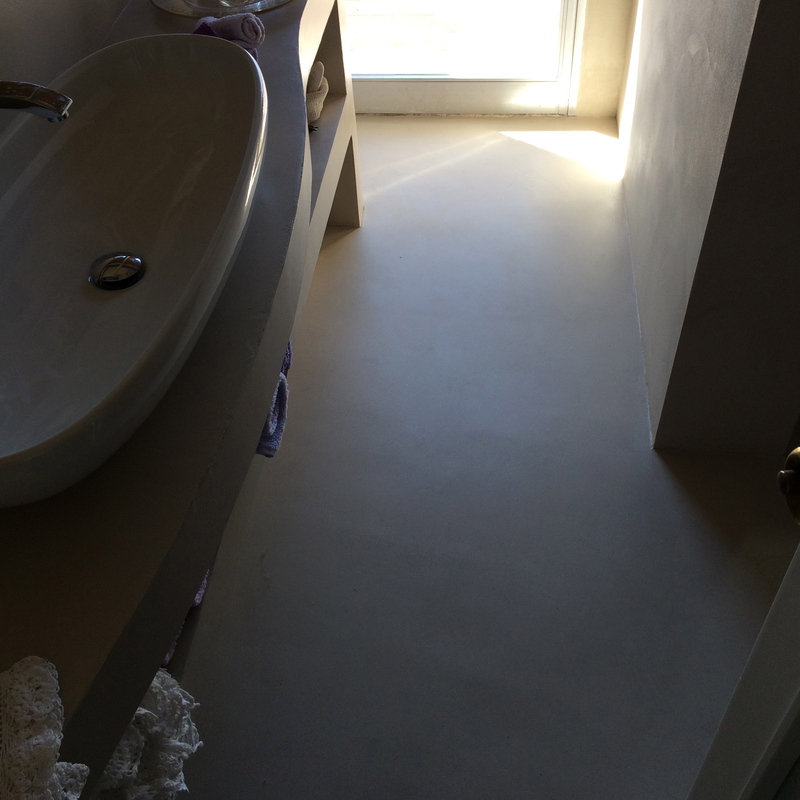 Once cleaned the surface, simply recolor with Microresina and you’re done! 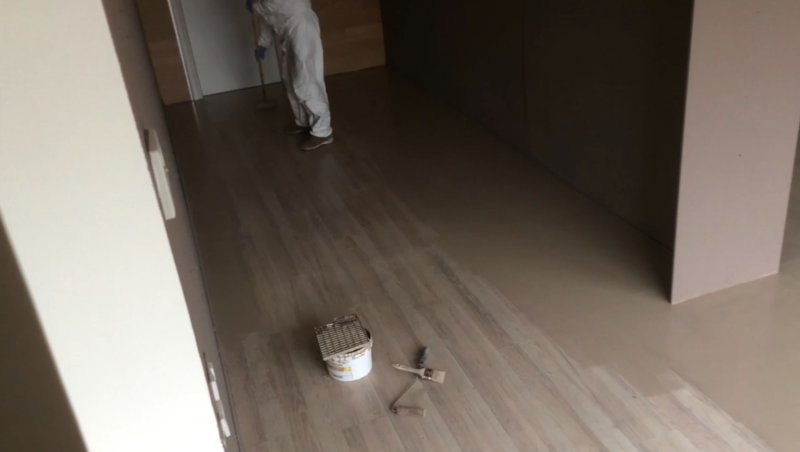 Microresina is a product suitable for both the professional and for enthusiast “do it yourself”. 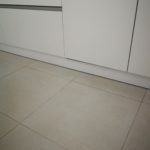 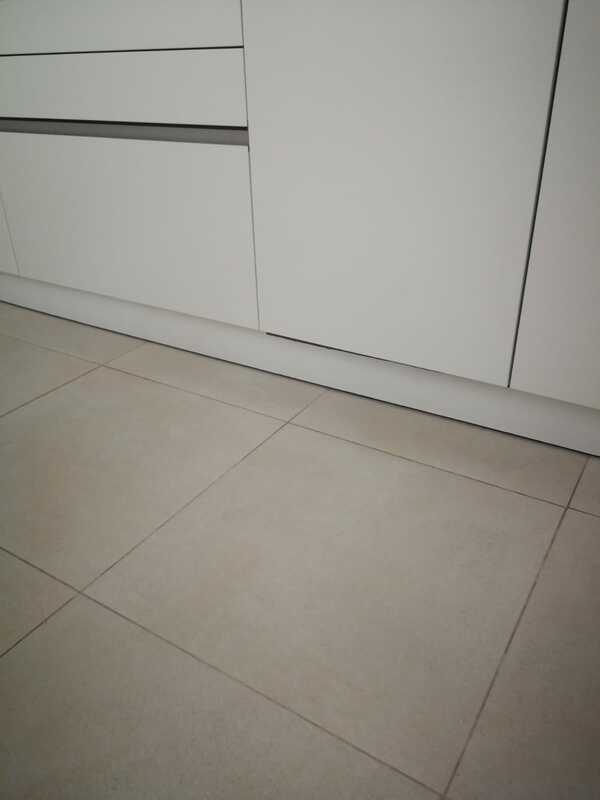 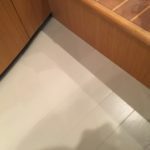 The kitchen with porcelain stoneware floor with a classic size often risks not being the ideal aesthetic choice with the passing of the years. 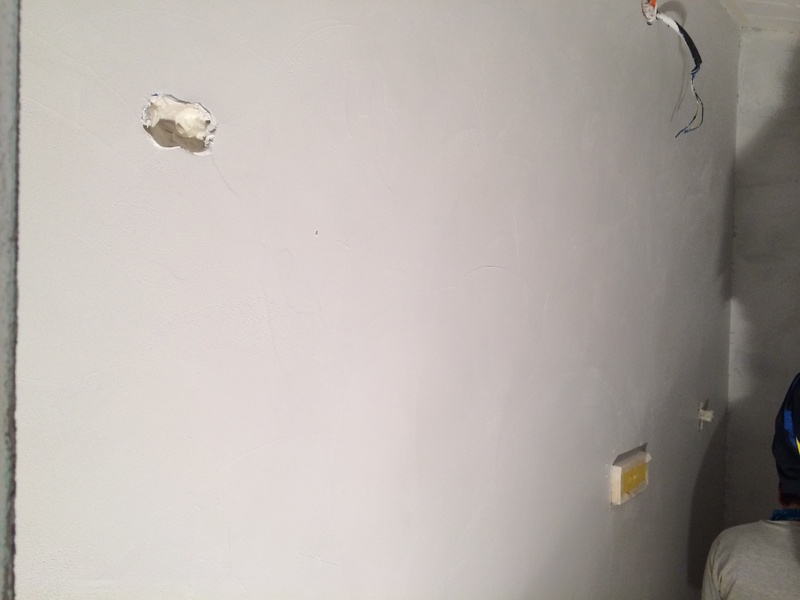 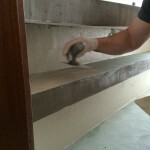 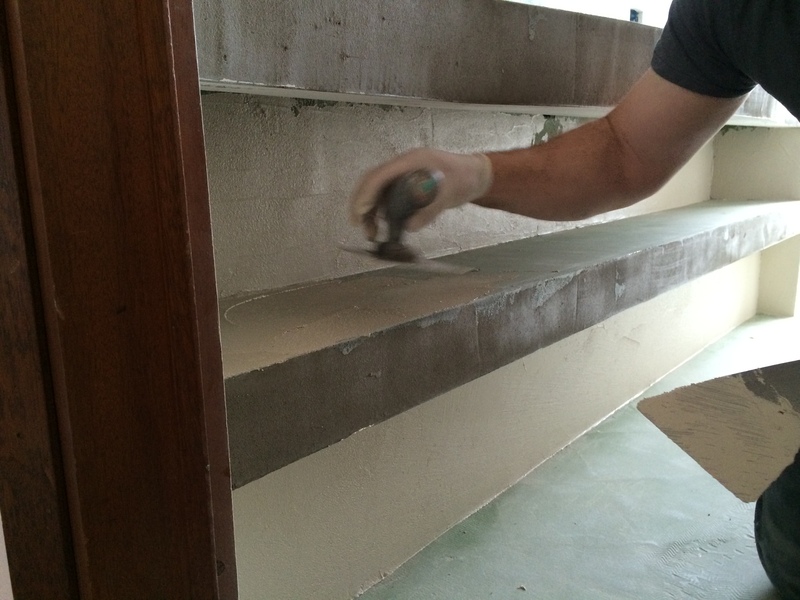 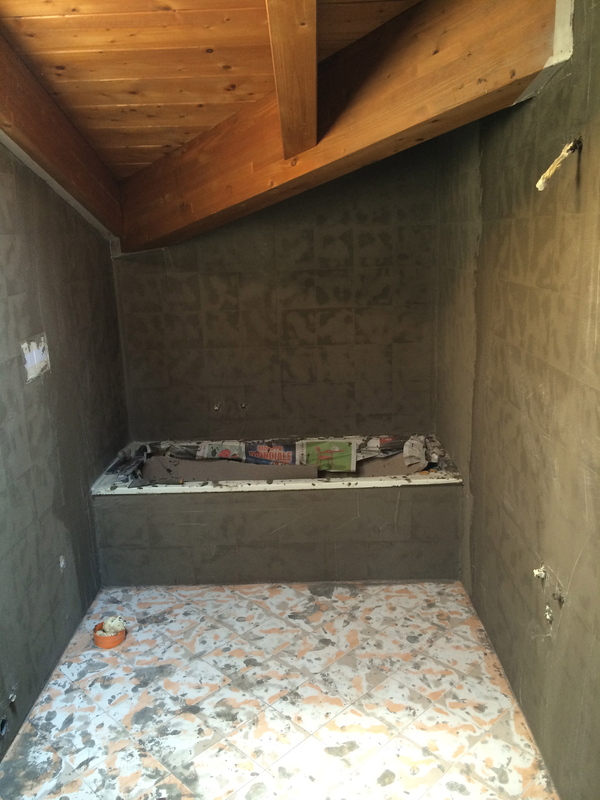 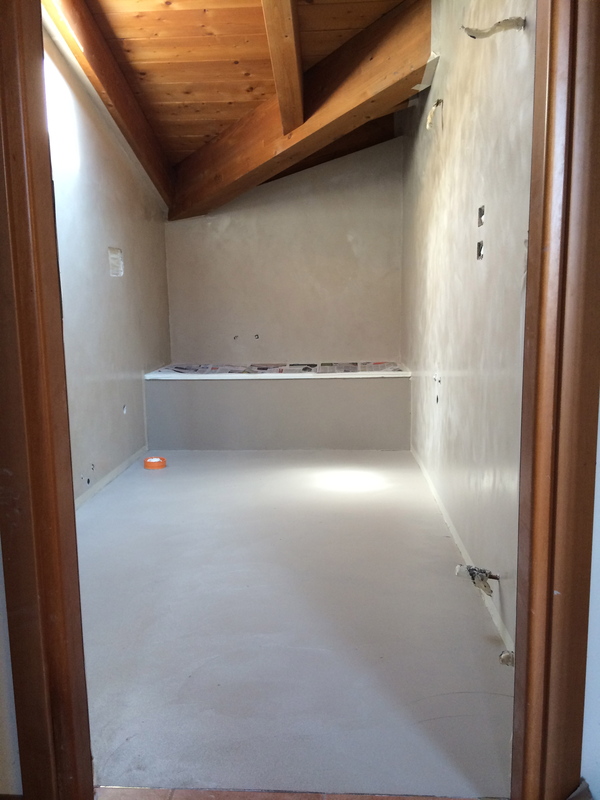 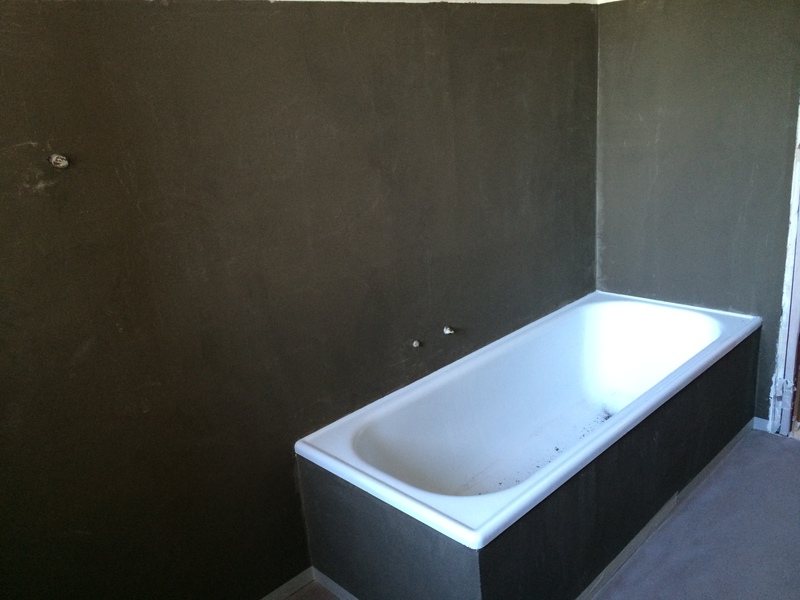 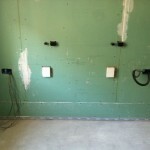 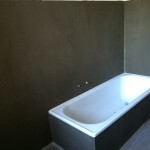 Our client, Marco, has chosen to renovate the surface with Cementoresina and, in a week, we have made this restyling! 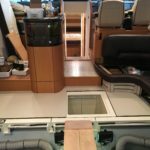 Microresina® also tackles the sea! 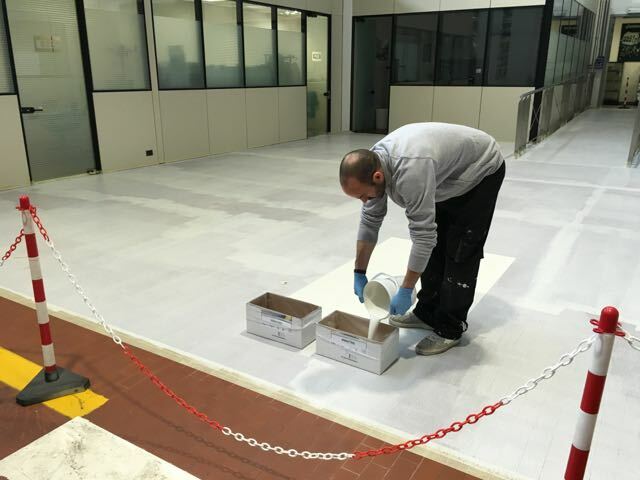 The recolor cycle of Microresina® also passed the test of the sea! 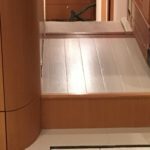 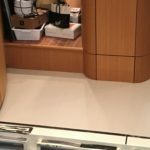 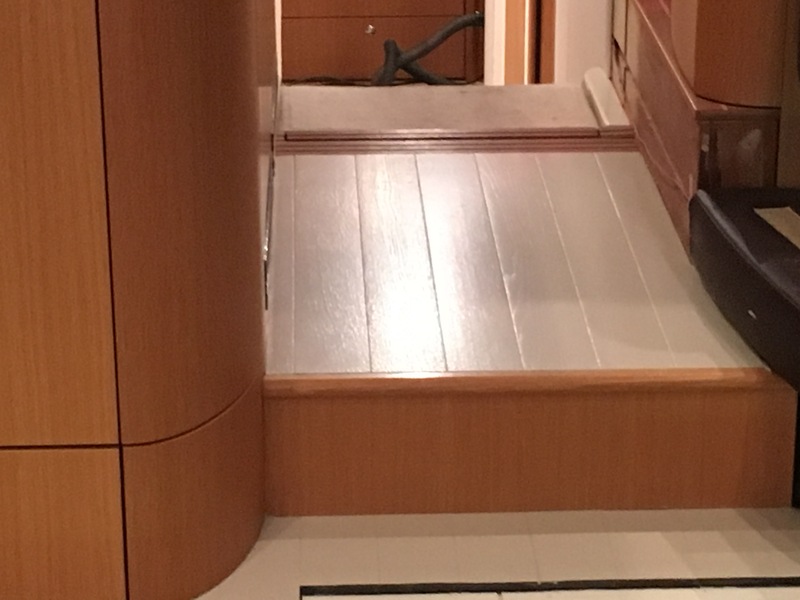 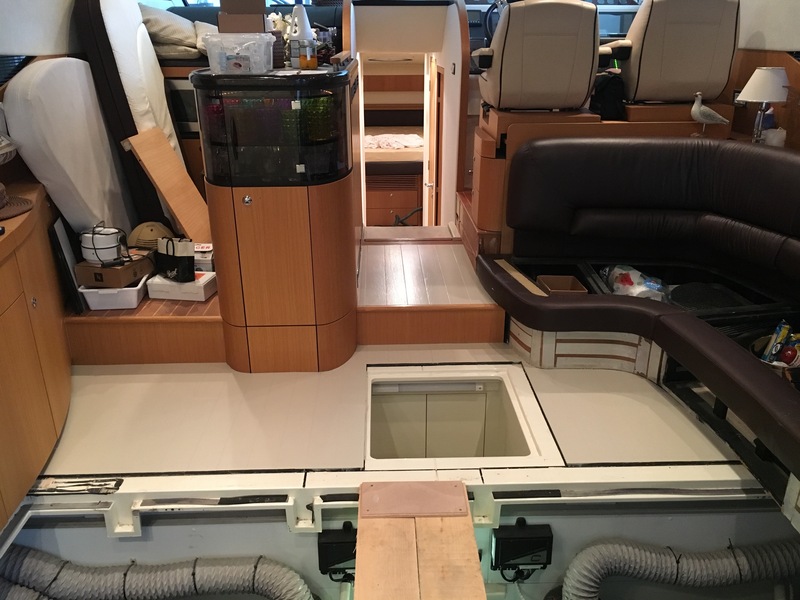 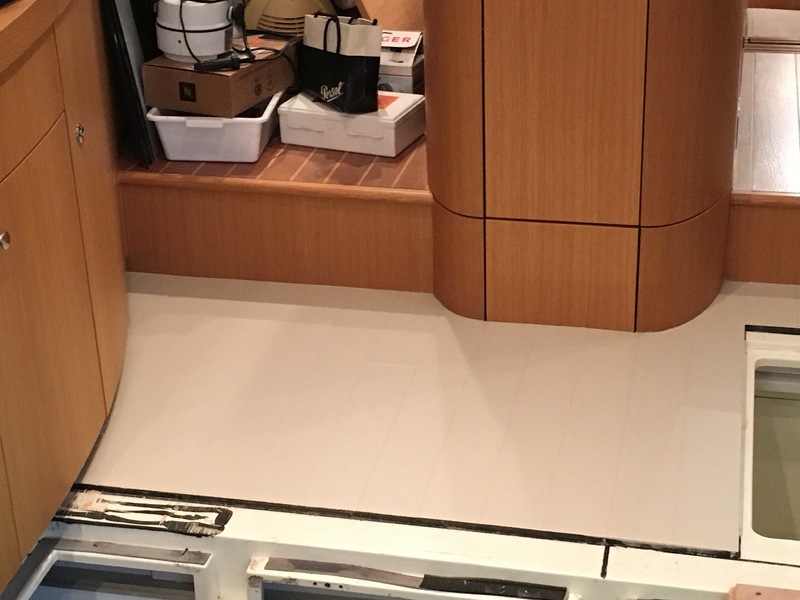 The interior flooring of a boat of high quality has been renewed with the colors of the Microresina® program in absolutely rapid time. 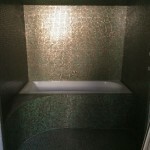 A new look, new for the location but of great effect! 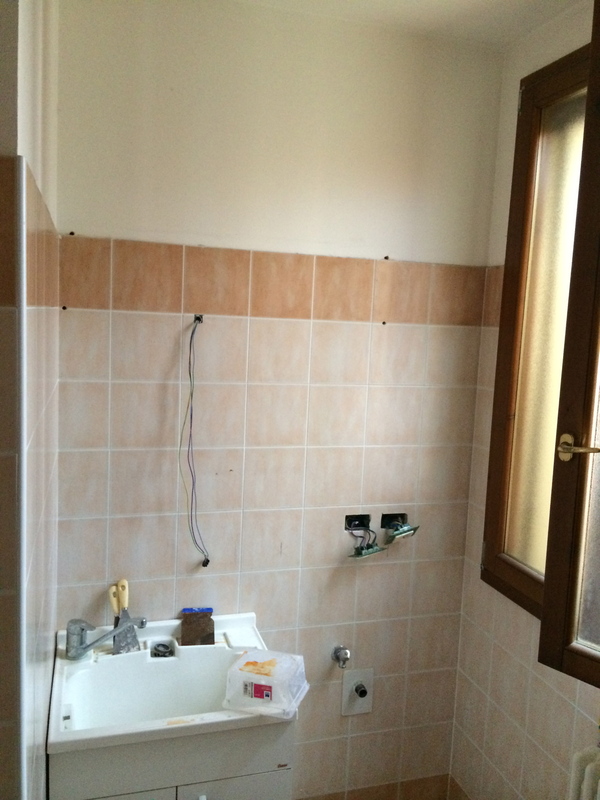 Thanks to the designer Elisabetta Tanesini for the choice towards our application. 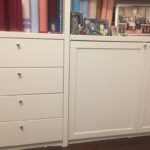 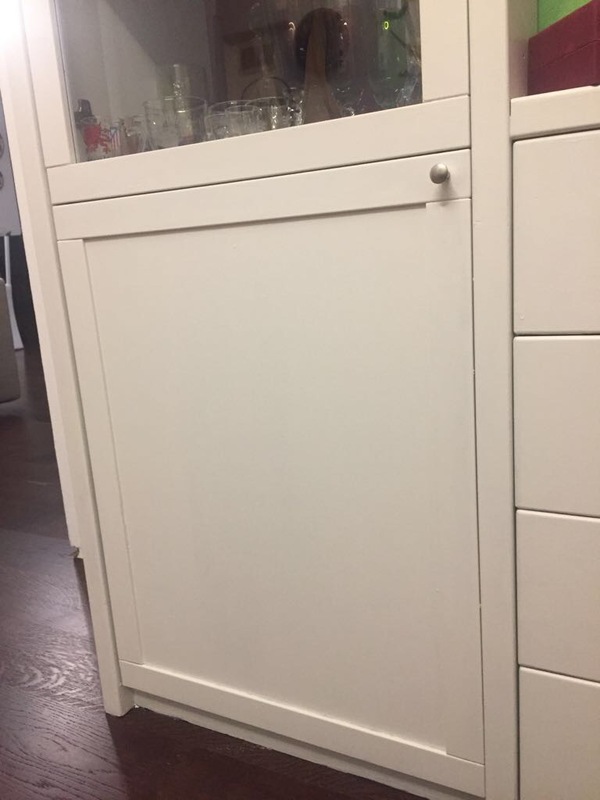 Renew your furniture? 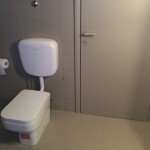 It is easy with Microresina! 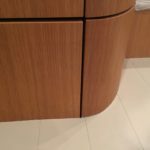 We publish this restyling of a piece of furniture in a living area with classic colors: our client’s need was to contain costs, executive times and to use a product that is aesthetically sound, resistant and environmentally friendly. 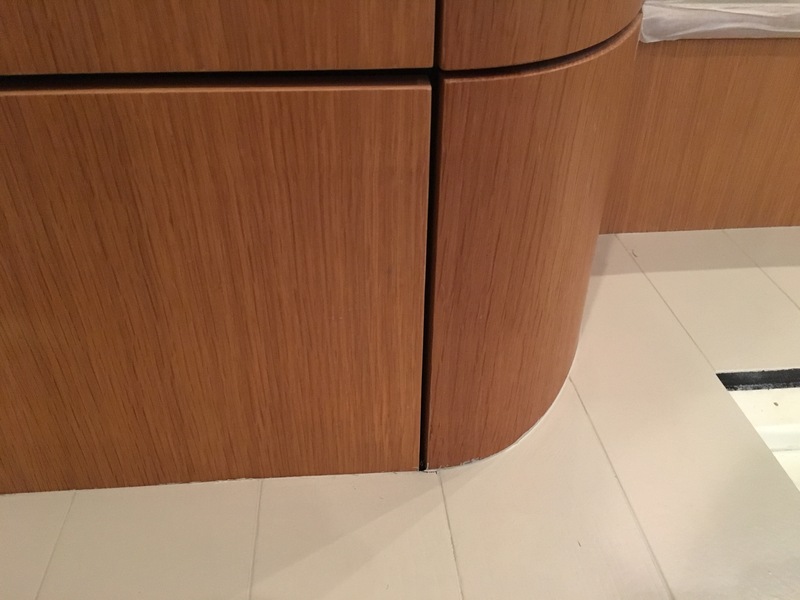 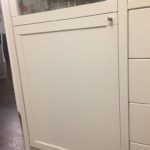 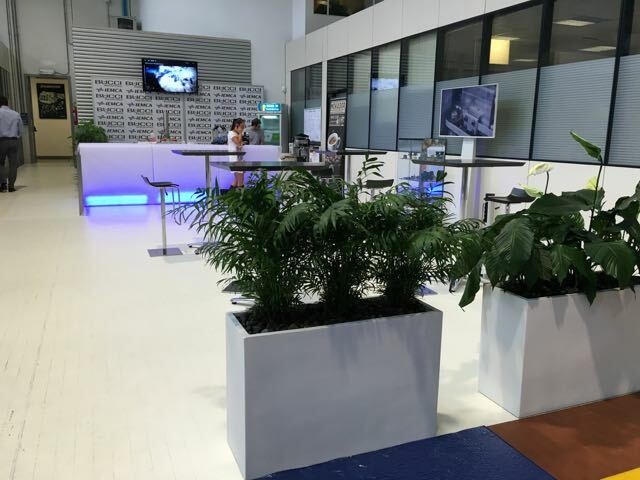 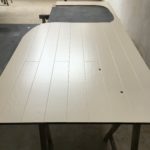 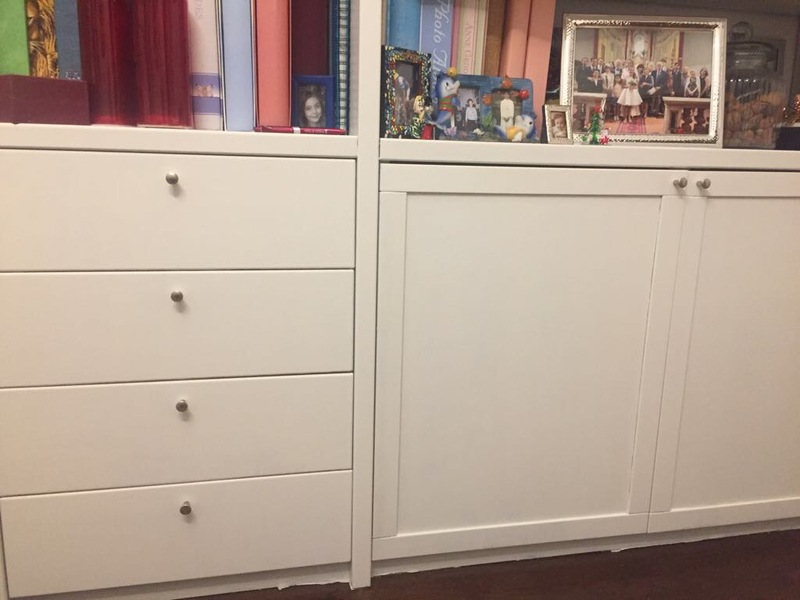 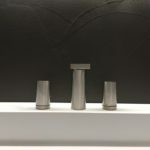 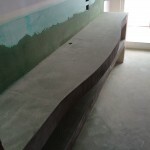 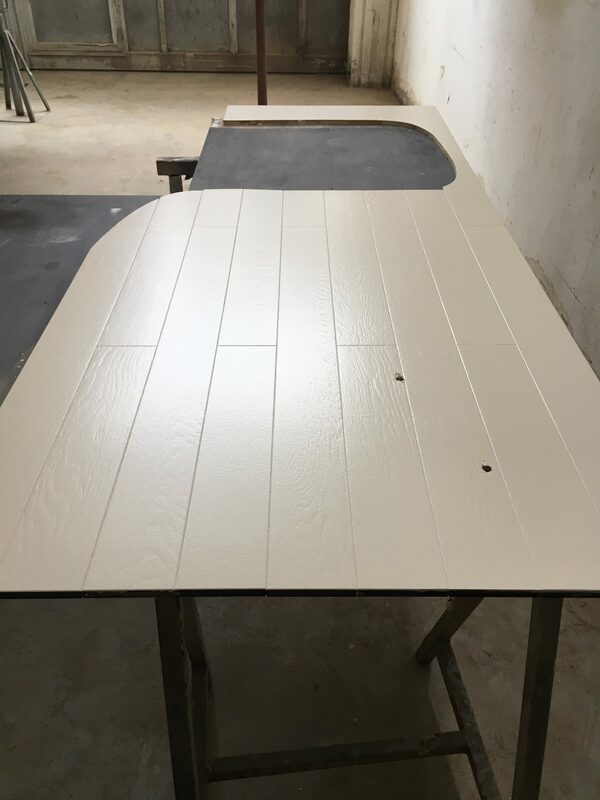 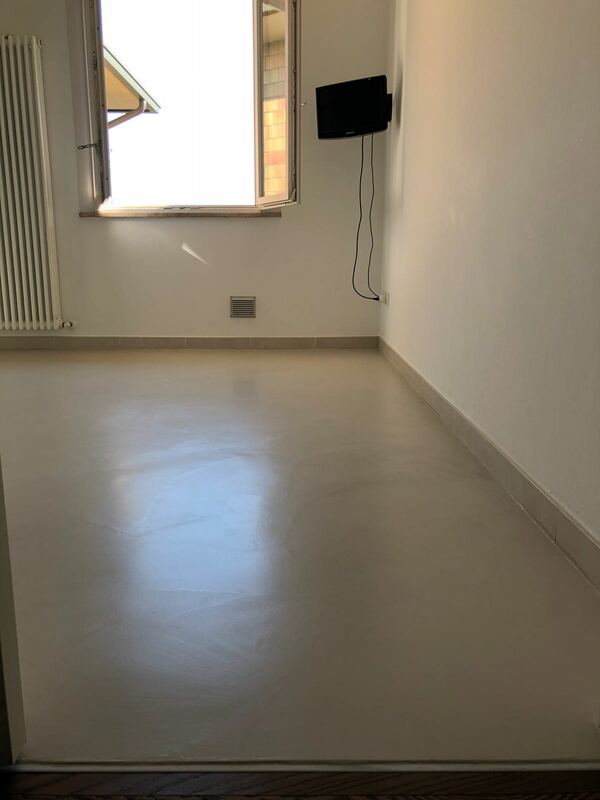 Microresina was the ideal choice for this “renewal” of the furniture: the ease of preparation and use of microresin allowed a safe and fast “do it yourself” and the result … look at the pictures! 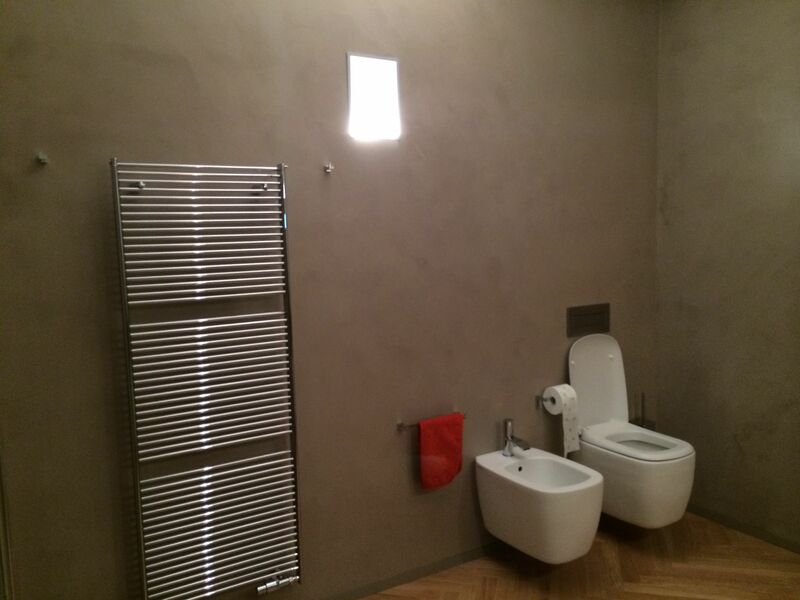 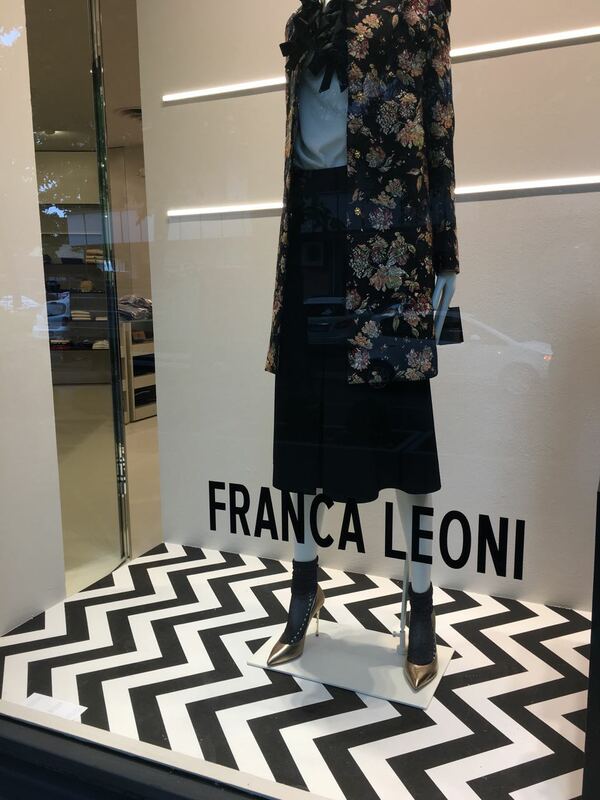 Franca Boutique in Forlì has been a good example of the potential for renewal of surfaces with Microresina® Kdh. 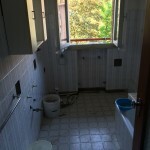 Few days of work, fast and with a result immediately agibile by the property! 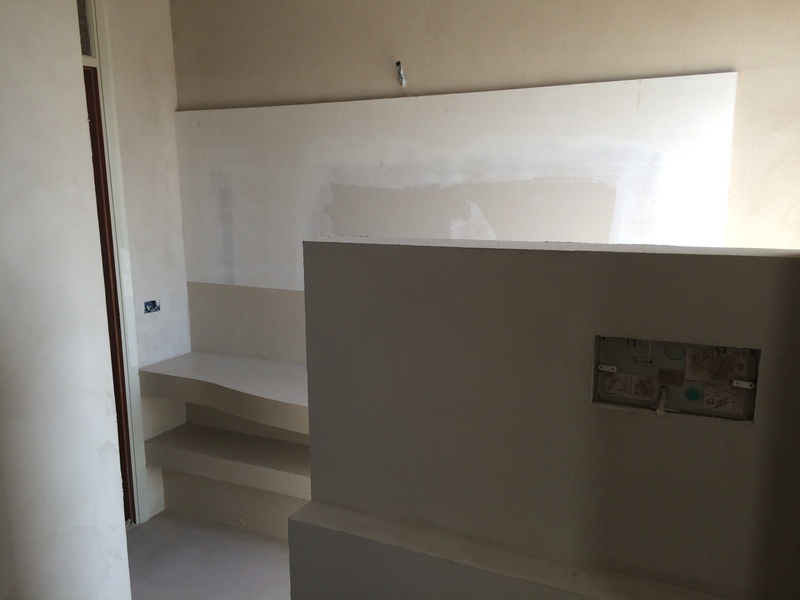 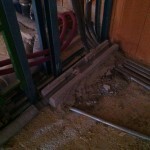 We invite you to view the video below that collects the images of the construction site steps click on the photo! 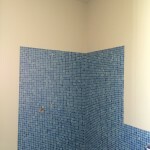 Contact us for more information !! 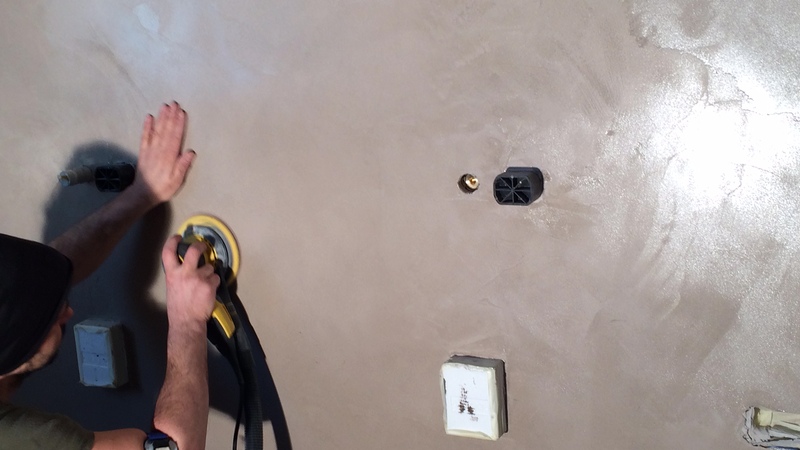 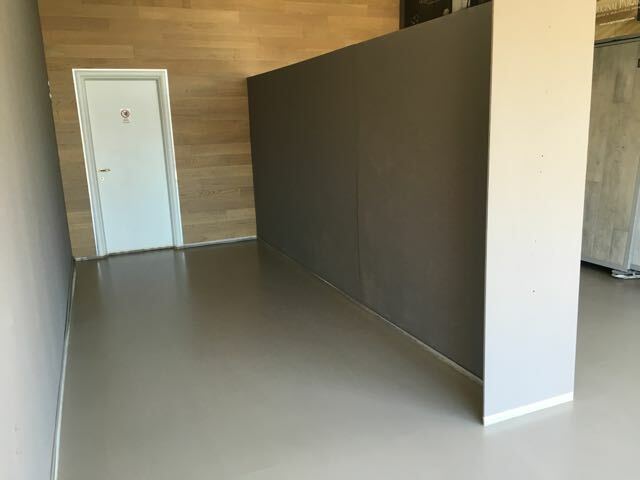 Thanks to one of our customers in Zadar (Croatia), we can show some pictures of how the surface continues Wallcrete has integrated perfectly in a very particular context. 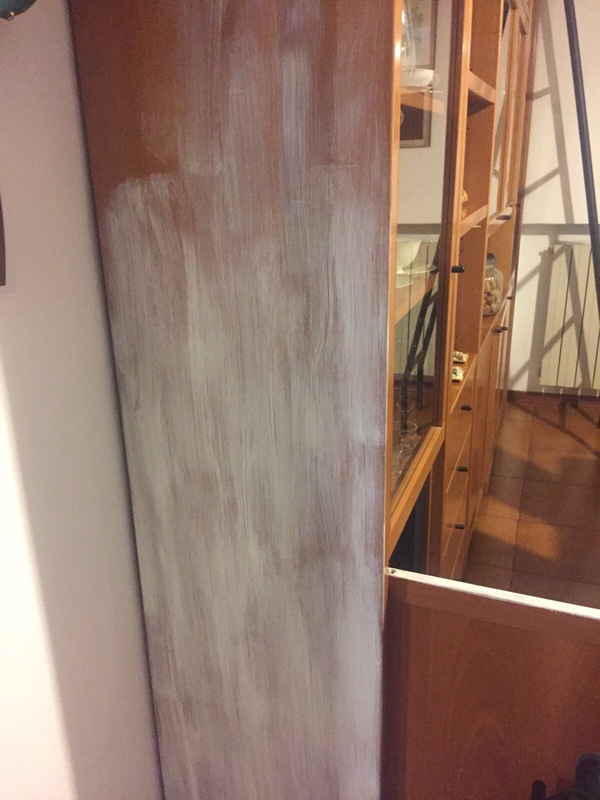 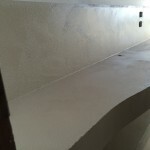 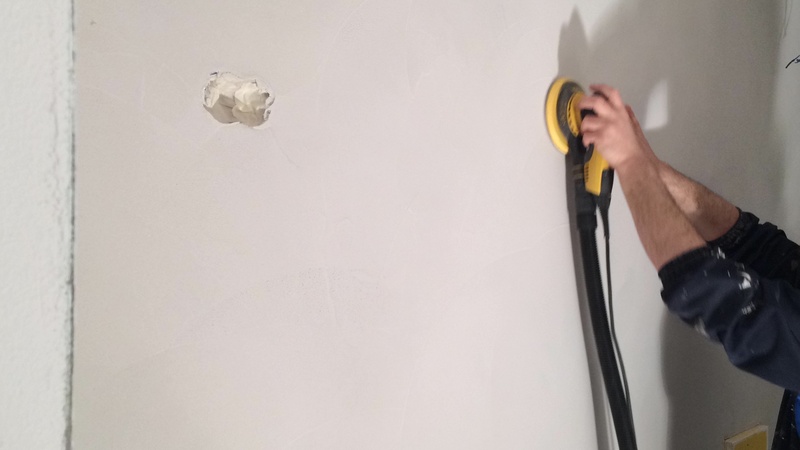 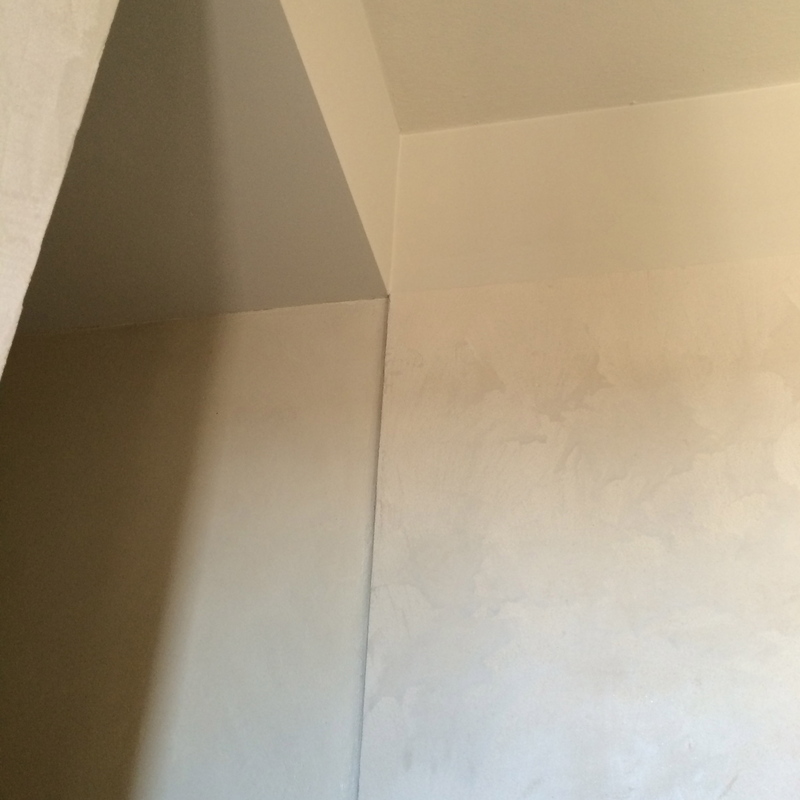 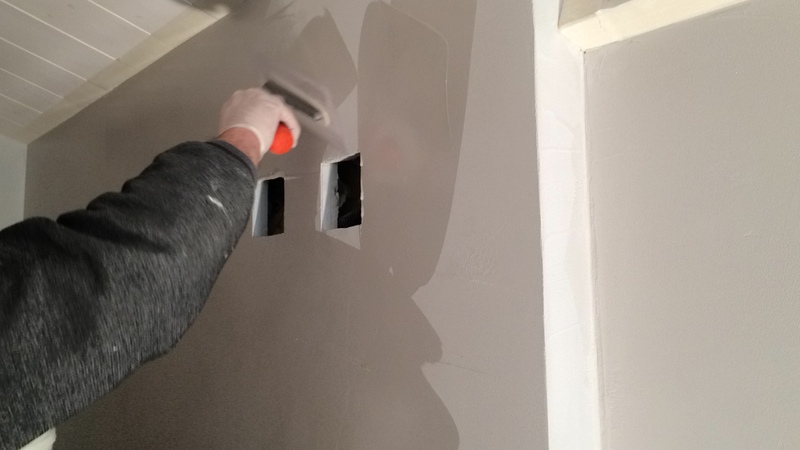 Generally we are used to seeing continuous surfaces in rooms with minimalist and modern look: in this case we have proposed the Wallcrete texture for a type of restoration of historic homes in Croatian countries: homes that , as in this case, are rented for periods of holiday. 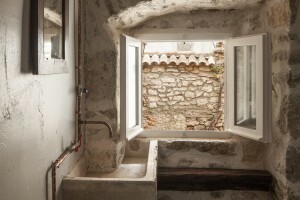 I would leave directly images taken directly from a professional photographer and collected on the official website of this restructuring in Novigrad. 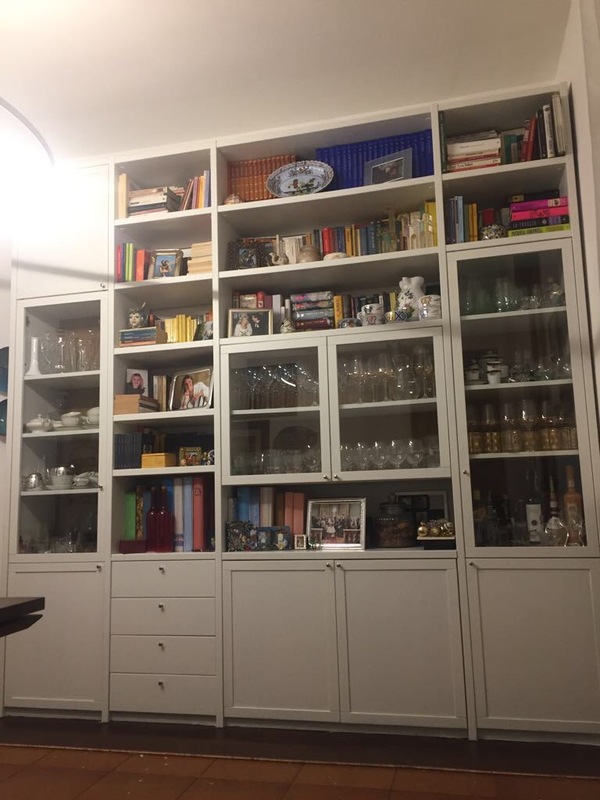 Click on the picture !! 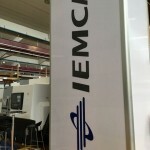 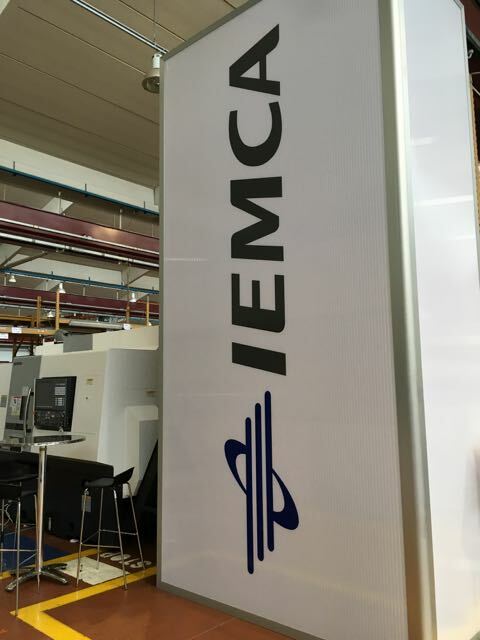 On the occasion of Open House Iemca (June 9-11) we would like to thank Cav. 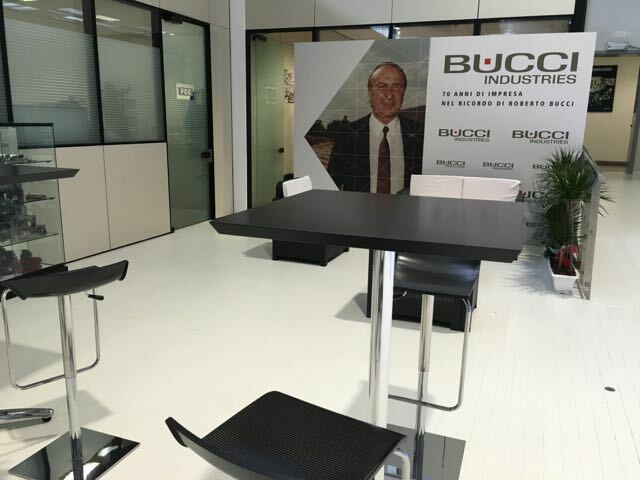 Bucci for the trust and the choice of our Microresina KDH used for the redesign of paving in an important area adjacent to Iemca production. 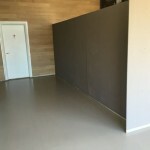 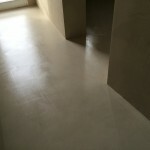 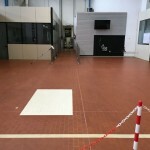 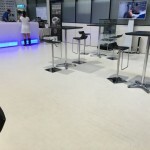 In a very short time we have tried to fulfill the request to renew the aesthetics of the flooring considering all the factors involved, easily imaginable, from respect not affect the operation and logistic production to the need for a durable product and easily ripristinatile, from eco-friendly caracteristic of Microresina to the expectation of an aesthetically winning result. 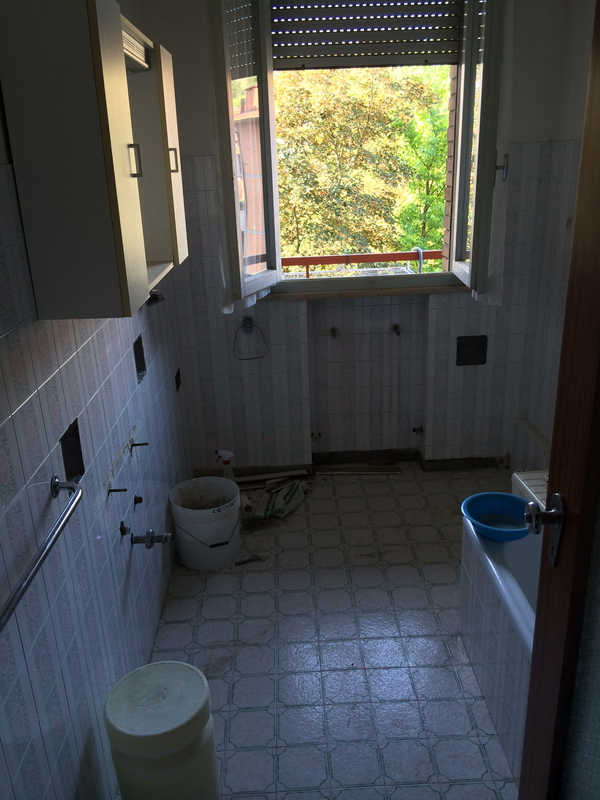 We too, often for the first, we are in need and the urgency to make a very quickly showroom restyling and at reasonable cost: two fundamental variables in any construction site economy !!! 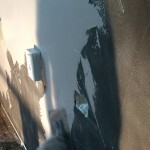 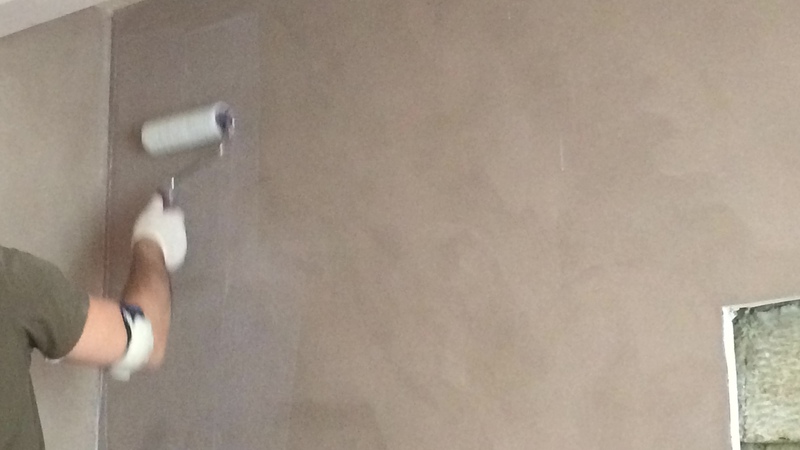 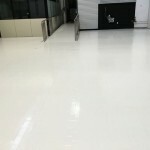 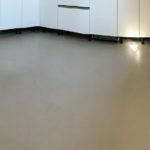 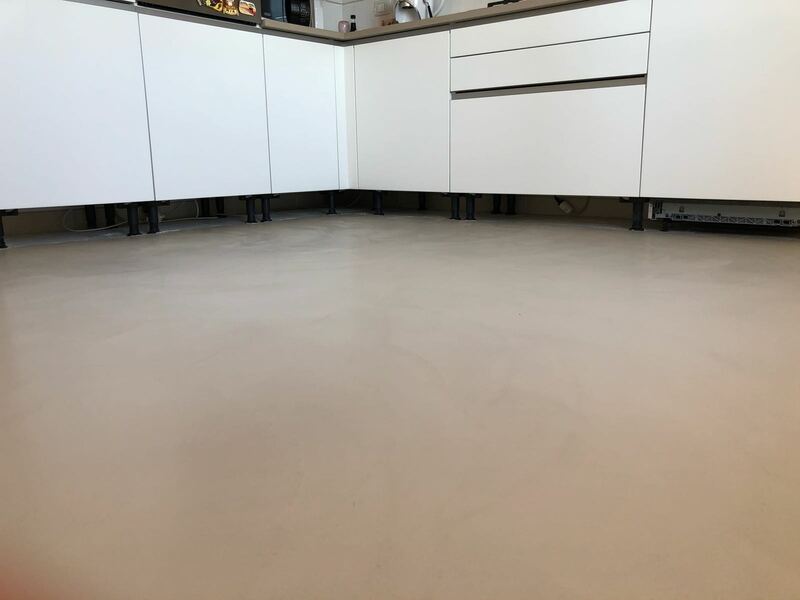 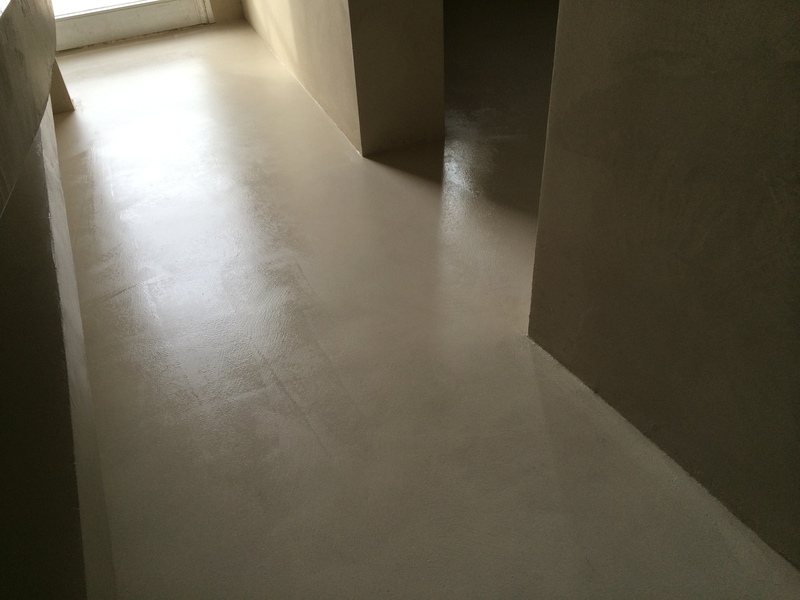 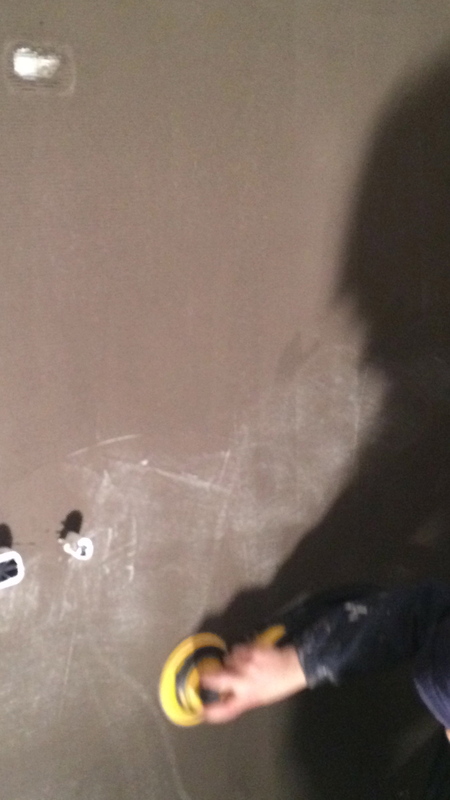 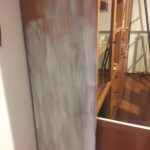 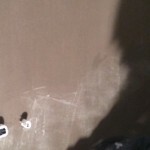 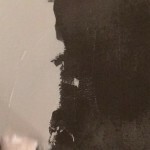 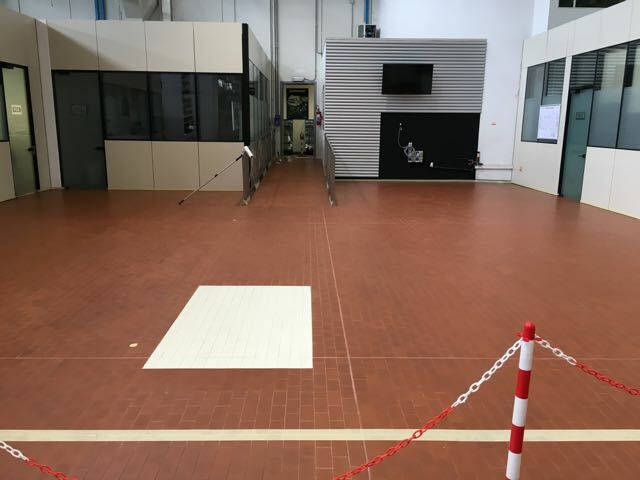 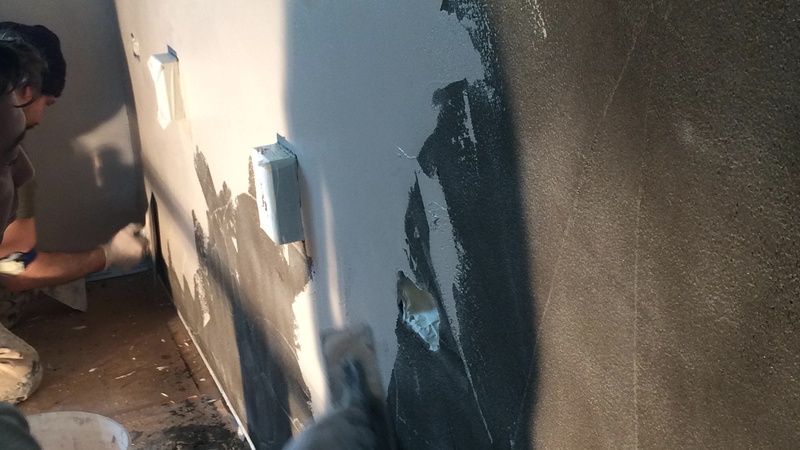 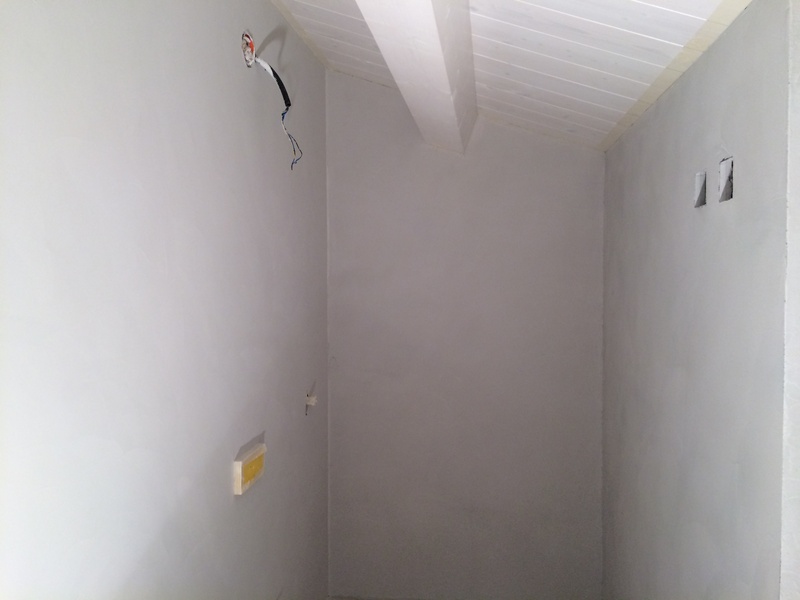 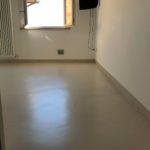 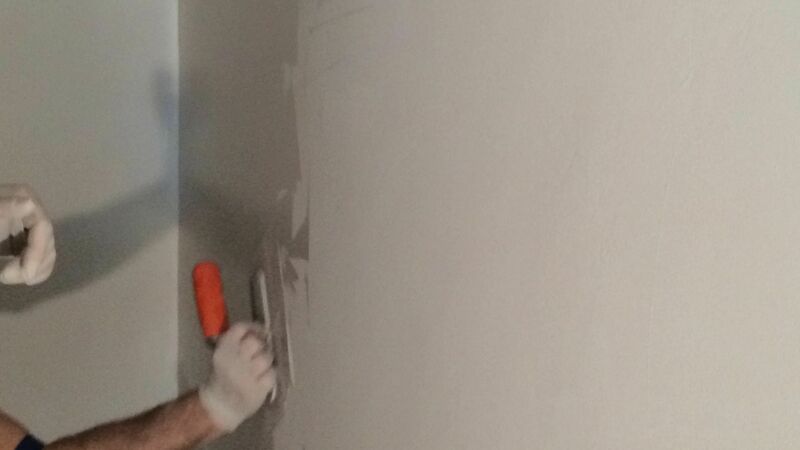 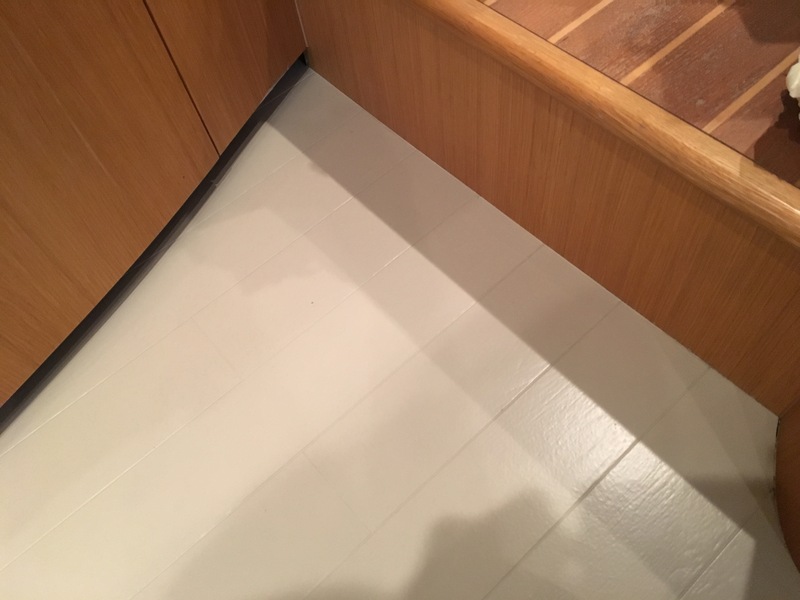 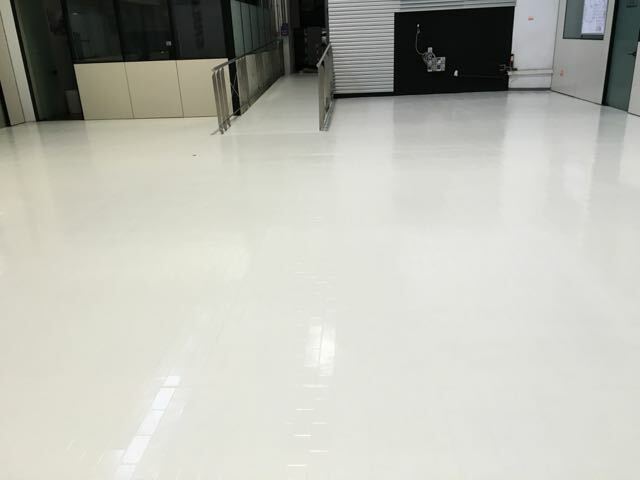 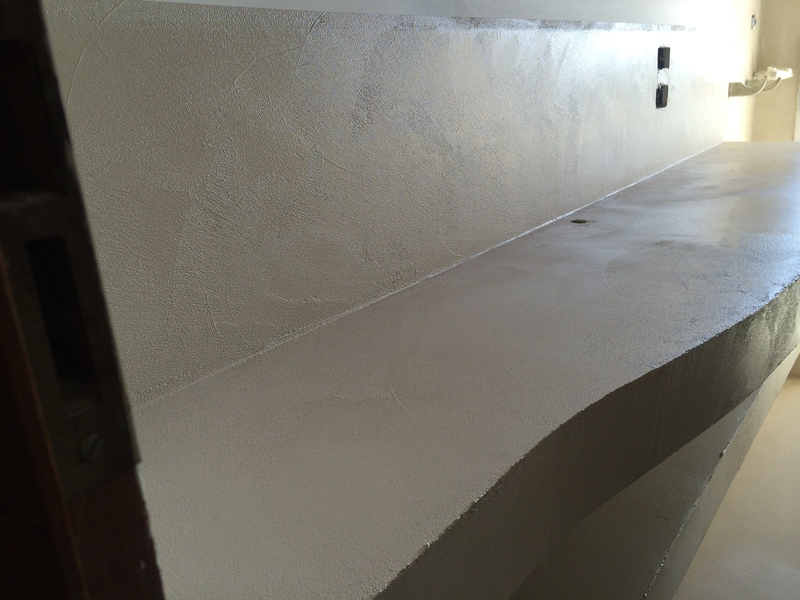 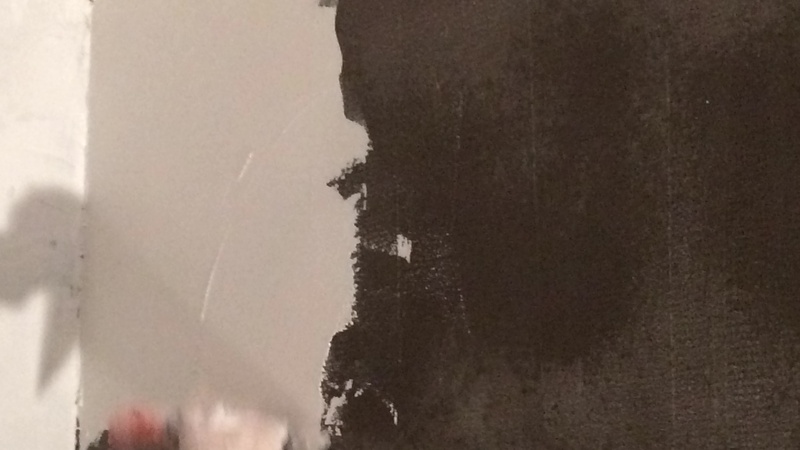 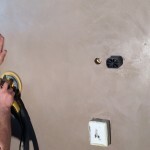 Using Paint, the siloxane painting for interior walls and Micronesina Floor, the resin to virtually zero thickness, we performed an environmental makeover in just two days !! 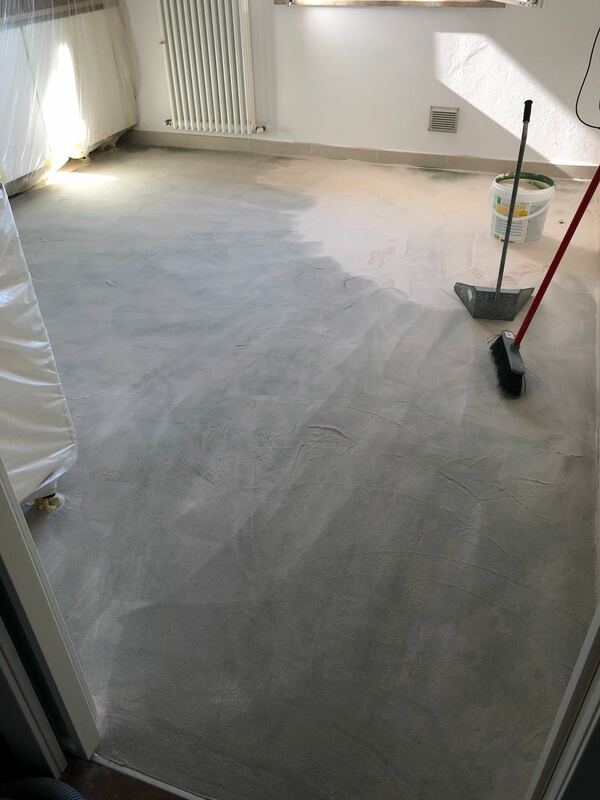 Microresina Floor, with its extremely short setting times, allowed to make walked the area in less than 12 hours and allow us to continue with the set-up: the aesthetic effect is a completely coverage effect revealing the texture of floor ( eg joints, cavities, textures..etc.etc.). 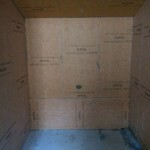 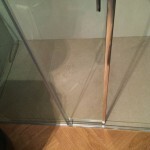 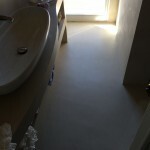 In this particular case, our floor, as you can see from the pictures, it is a floating laminate! 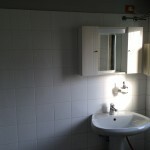 For further informations… contact us!! 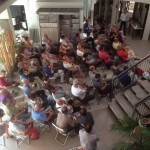 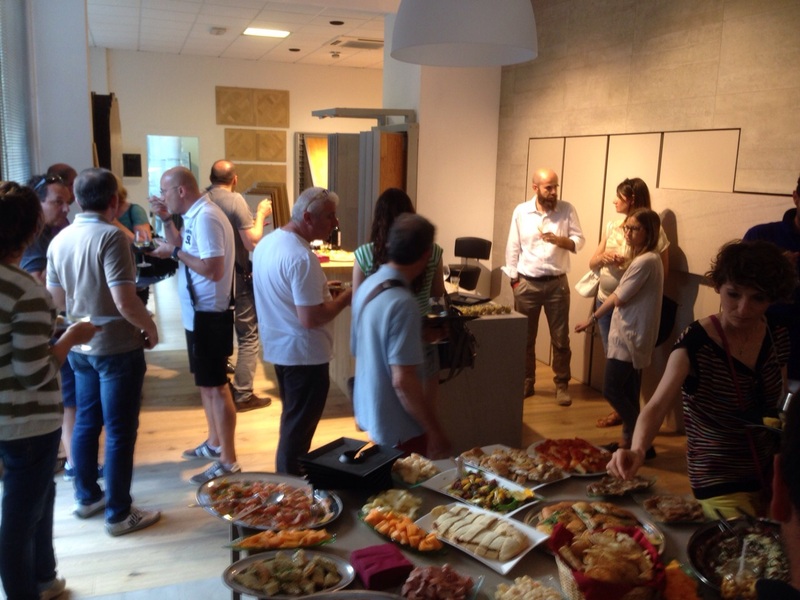 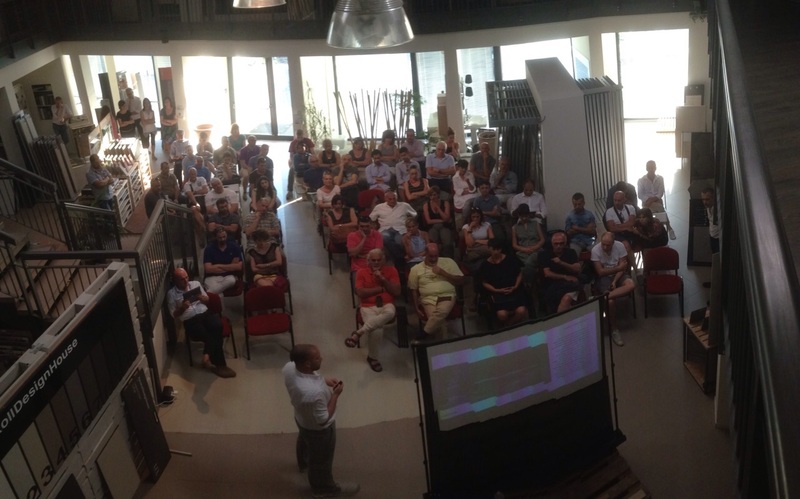 Wednesday June 10th, 2015, at the showroom of Meinardi was held the official presentation of the project Kerakoll Design House: the project of continuous surfaces that is revolutionizing the design of interiors. 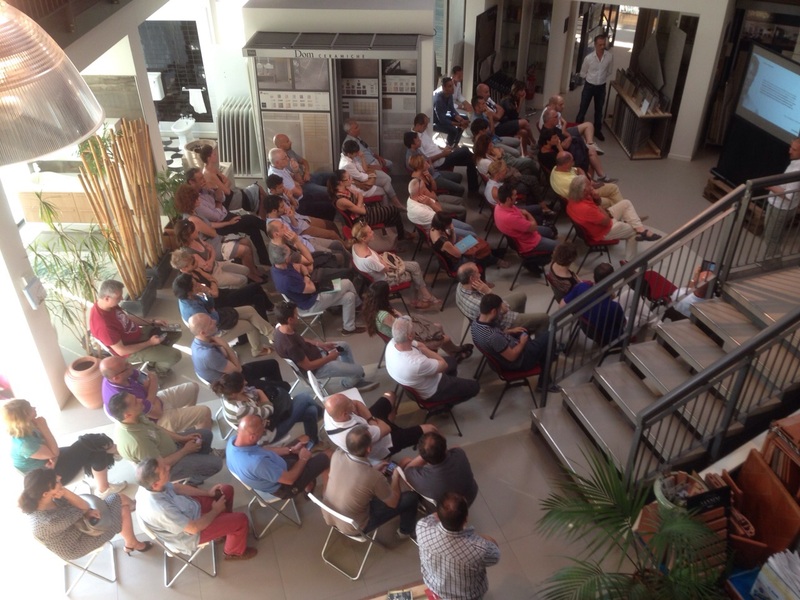 Expertly led by Luca Mosetti, which follows from the very beginning the project KDH, the presentation was a unique opportunity to learn more and, for some, discover the potential of the many surfaces of Kerakoll Design House: from Cementoresina to Cementoflex, from Wallcrete to Patina, from Wood + Color to Microresina. 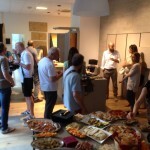 After the presentation was delivered to present the new book of continuous surfaces. 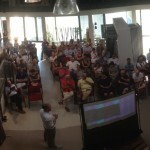 The event continued with a cocktail managed by sommelier Omar Quarneti, owner of the famous winery “Cantine Antica Grotta” Riolo Terme. 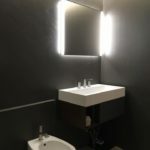 Thanking those who were present at the event, I wish also to thank those who would like to partecipate but there were no more available seats: the invitation is to come to our showroom and, guided by the staff of the showroom, view the project Kerakoll Design House. 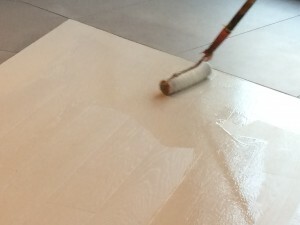 At Meinardi Sas you can buy the brand new Microresina to recolor your surfaces! 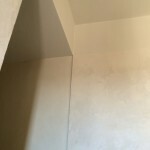 With simple guidelines, you can give new life to many surfaces: a new, cheap and fast, to edit and reinterpret walls, objects, surfaces inside your home. 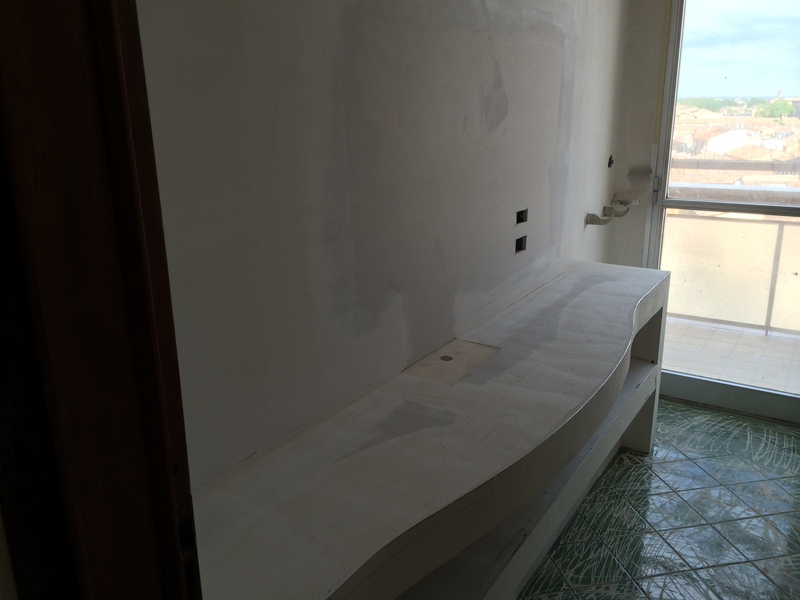 For more information … come visit us or contact us !! 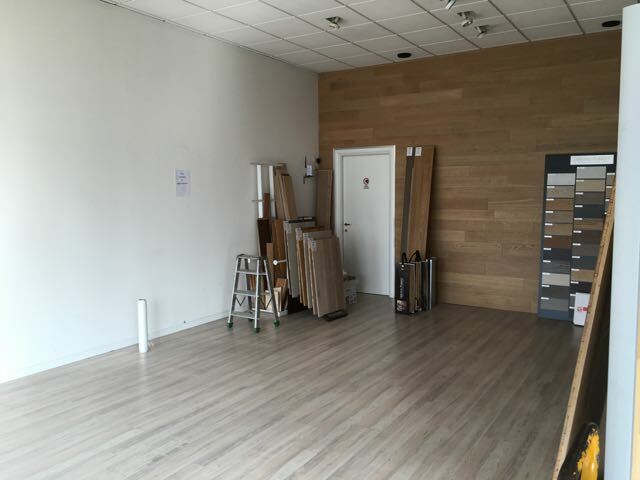 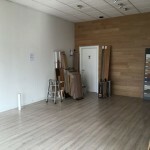 Friday ended in the showroom the installation of new wood Flooring surfaces sold by Kerakoll and related to the Kerakoll Design House (Re) design program . 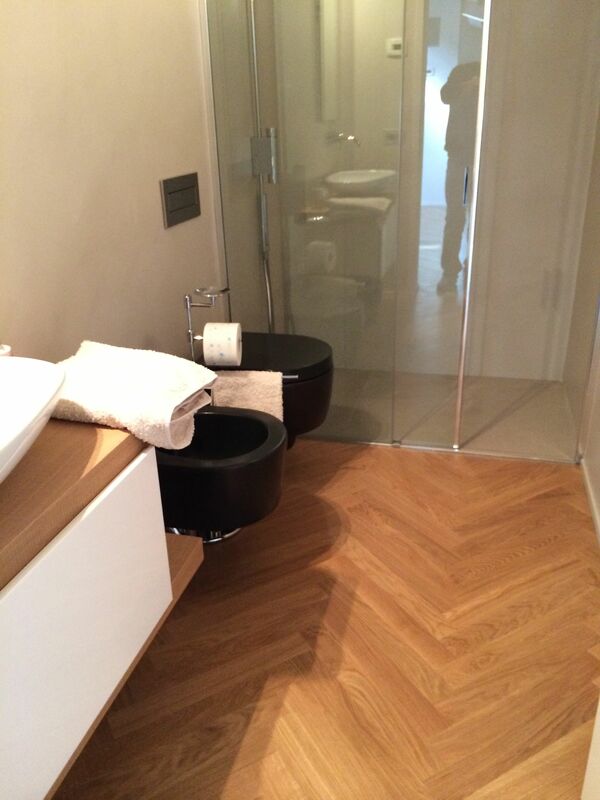 The main focus, apart from the texture and size of the innovative Parquet carefully selected and produced by Kerakoll, was certainly the possibility of renewing a old existing parquet flooringin less than 12 hours! 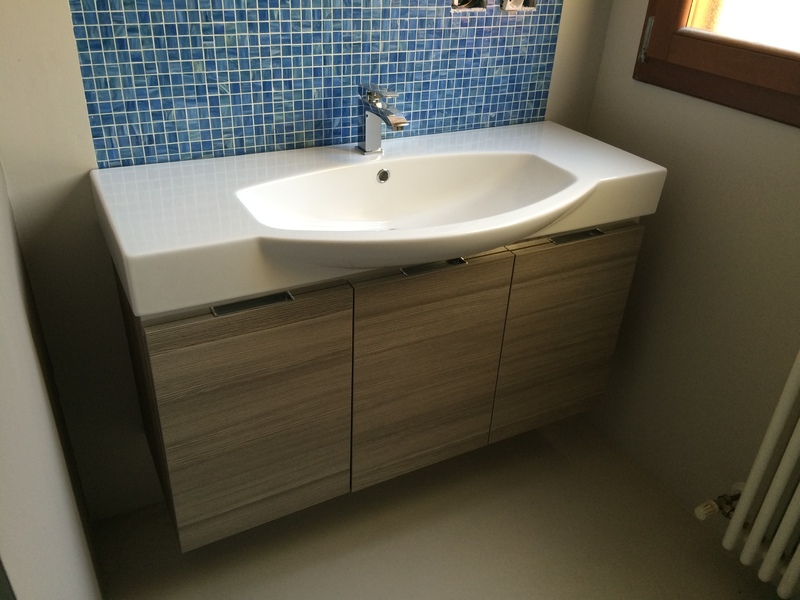 Thanks to the cycle Microresina Wood + Color, this is possible. 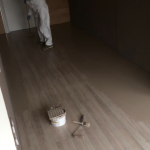 If you click on the image below, you can watch at a little video clip that collects the work phases that have affected the demonstration. 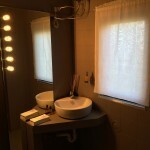 With Make up! 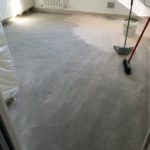 you can finally achieve a makeover of your environment with certain times and costs: clicking on the photo, we briefly describe the program and you can see some pictures taken directly to the site. 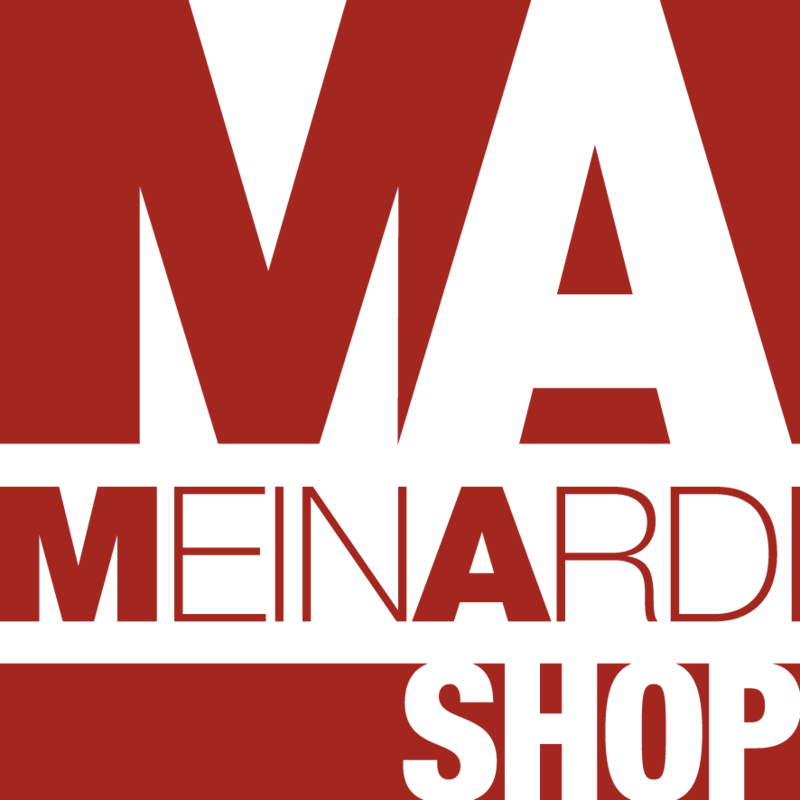 Meinardi presents a preview of MAKE UP! 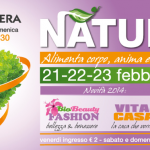 at NATURAL EXPO in Forlì on February 21st, 22nd, 23rd, from 10.00 am to 7.30 pm. 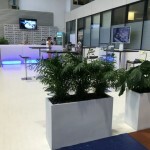 By clicking here, you will have more information on NATURAL EXPO: we wait for you on the stand of MAKE UP!